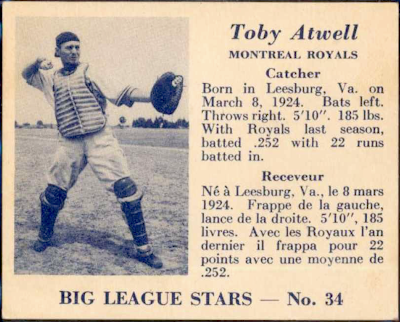 Until last week, I never thought about Toby Atwell, mid-1950s catcher, as either player or baseball card. He's just one of those guys you flip past in the collection. Toby's minor claim to collecting fame follows his "status" as 1952 Topps #356, one of its elusive high numbers, not that Toby seems to be enjoying the privilege. 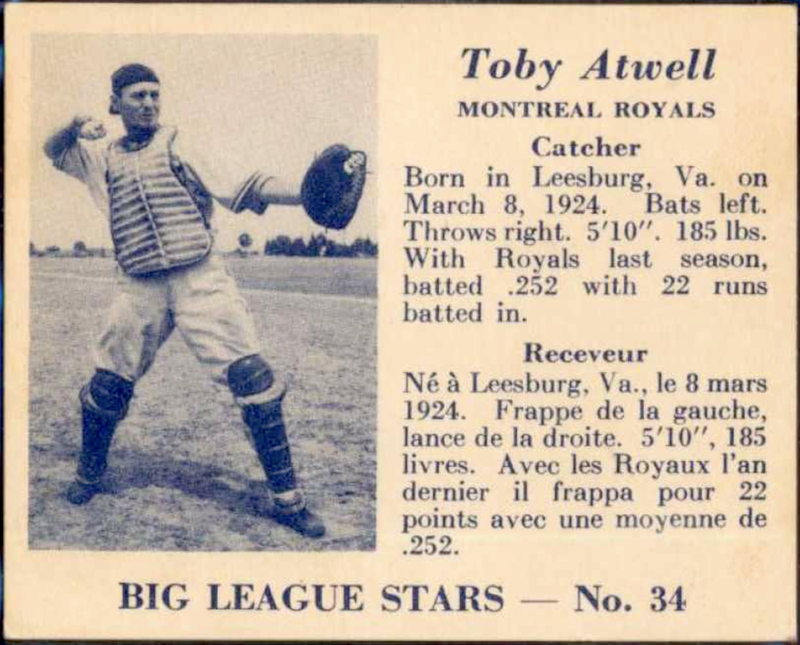 After a week delving into 1950s Bowman and Topps, I found a second reason to care about Toby Atwell, and it's not thanks to high numbers or rookie cards. It's caring about the business value of using what you have and using it well. 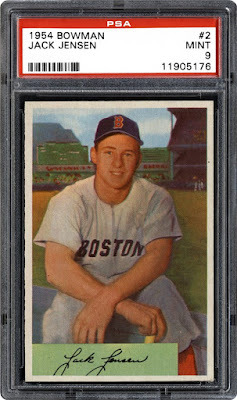 Let's start that work with 1954 Bowman #123, "serious Toby." 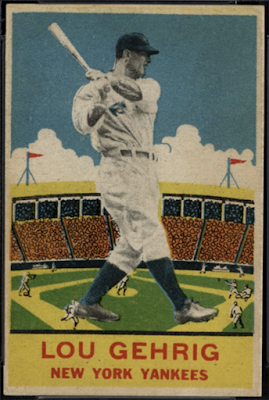 Back to Toby, the baseball card, built from a hand-colored photo and purple autograph nameplate. ...and #210 Jimmy Piersall intruded on #218 Preacher Roe. While Bowman corrected these "extra loops" on later print sheets, I wondered about Toby Atwell's 1954 card and its floating double-line above the "T." Was that yet another player's autograph overlapping onto #123 from a different direction? In this case, no. 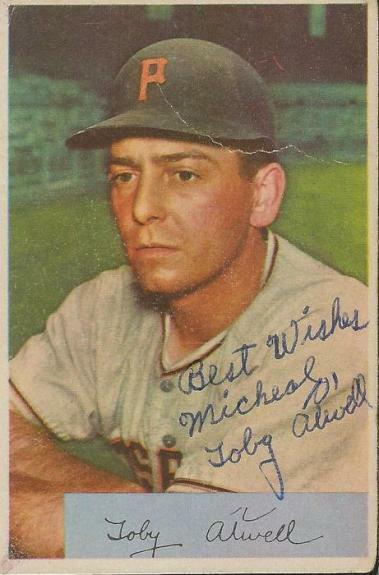 Autograph image searches show that Toby crossed that "T" with a wavy line throughout his life, as seen on this signed 1954 card. Bowman's odd trim job left it more mysterious than it needed to be. 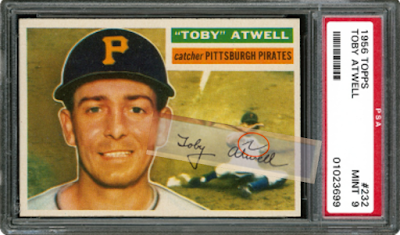 "Atwell" shows floating line above "T"
Seeing 1954 Bowman lop off pieces of both "Y" and "Atwell" made me wonder if they even owned a proper signature for Toby at all. It took investigation of three sets to answer that question, starting two years earlier. Bowman's first player autographs appeared in 1952. 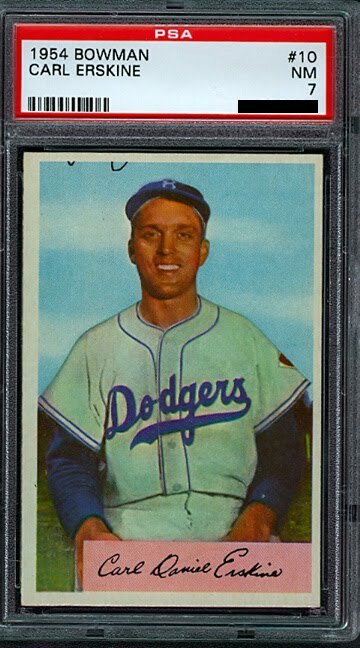 I think they compliment that year's artistic work, even if their cards feel "small" compared to the more sizable 1952 Topps. I also think players produced one signature that Bowman reused whenever possible, saving card editors valuable time. This held true even for big stars with fixable issues like "Willie May" in 1952. 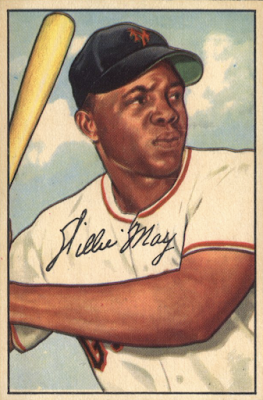 Two years later, Bowman's aforementioned "loop trims" reduced the same stamped auto to "Willie Mau." 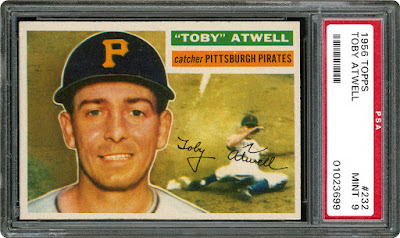 Toby didn't appear in 1952 Bowman, so they acquired a signature for on-card use sometime between then and 1954. 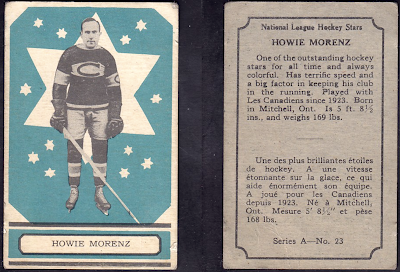 Look at his 1952 high number again and note the "Maurice" signature. Toby had been on Topps cards for 1952 and 1953, before moving to Bowman for 1954 and 1955, perhaps on an exclusive contract. Jason Schwartz talks in detail about Bowman's skill at signing players to these contracts in SABR's 1954 Cardboard Crosswalk article. It's worth your time to read, now or later. 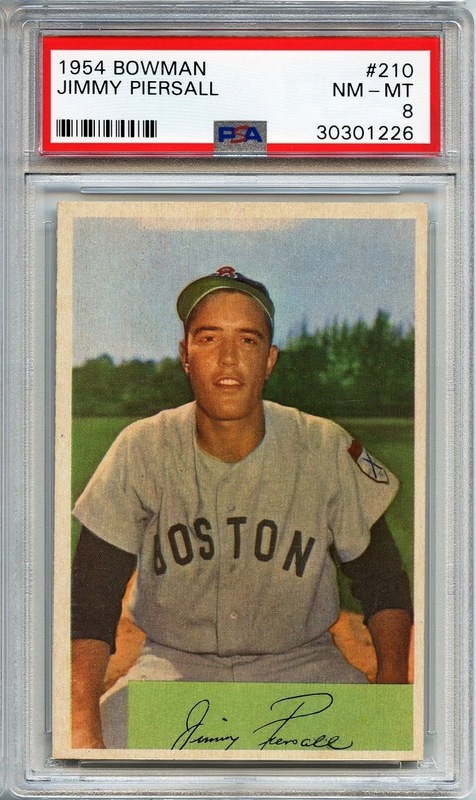 When Bowman folded after 1955 and Topps acquired their business assets, most recollections of the bankruptcy sale talk about the business value of existing gum card contracts. The nature of such a sale implies, without making explicit, that physical things like printing dies and plates also moved from Bowman to Topps. Toby's return to Topps cards after Bowman folded helps confirm the extent of what they handed over. 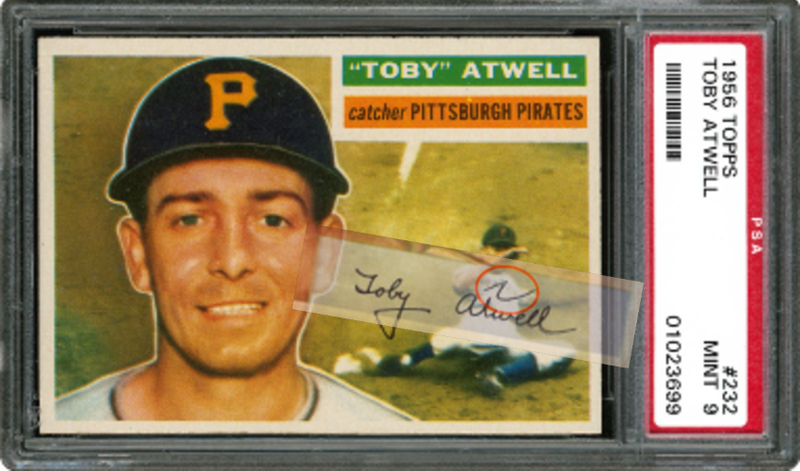 That "ghost" label's where I overlaid his 1954 Bowman nameplate onto 1956's "Toby Atwell" autograph and got a perfect match, including the wavy crossed "T" circled in red. 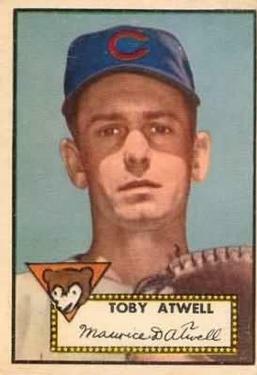 While "Maurice D. Atwell" on 1952 cards, he became "Toby Atwell" for 1956. 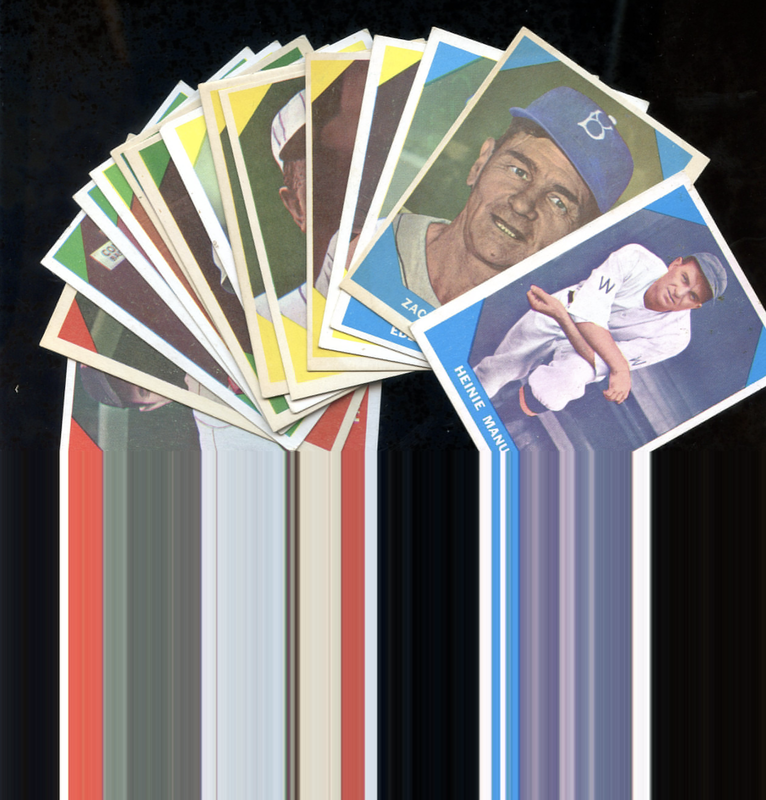 Unlike their former competition, Topps did this job without trimming pieces off the top and bottom. We can assume Topps did the same for a number of former Bowman players. Summary: You can spend a lot of time and effort producing cards and some sets cut corners to save both. 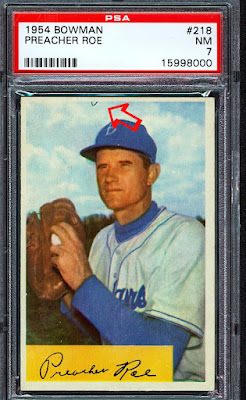 Bowman cut corners in a literal way, reducing the quality of their 1954 cards. There's some justice in how Topps improved on Bowman's dodgy choices with Bowman's own printing dies. If I were 1956 Topps Toby, I'd be smiling, too. 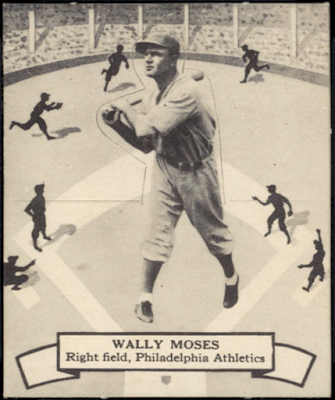 This post looks at Goudey Gum's card business across their 1933-34 baseball peak and where its mojo went during an ensuing creative decline. 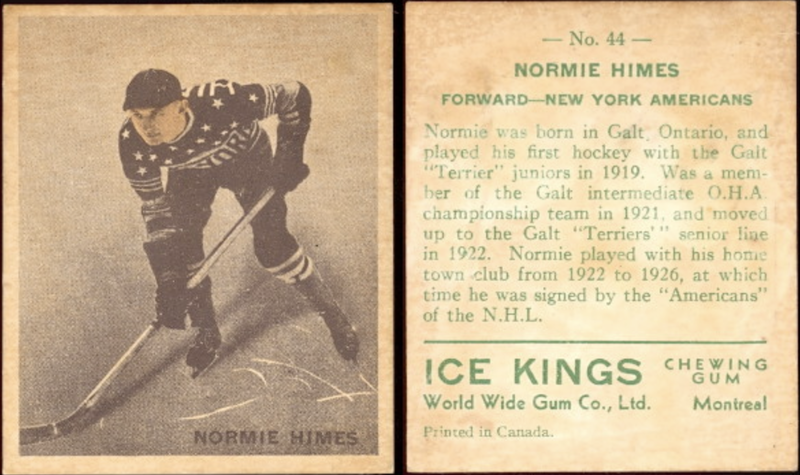 I bounce between a bunch of 1930s sets published by Goudey Gum, World Wide Gum, and their competition to show what "Canadian Goudey" added to our hobby and seek new understanding of these old issues along the way. 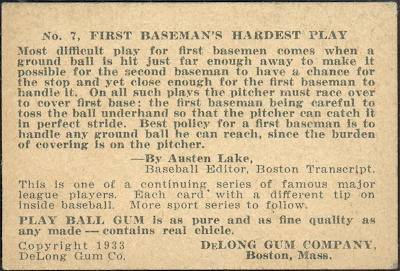 1933 DeLong Gum Play Ball! Thanks in advance for reading! And that's my favorite 1933 Goudey card, #133 Joe Judge. What a graceful piece of work. 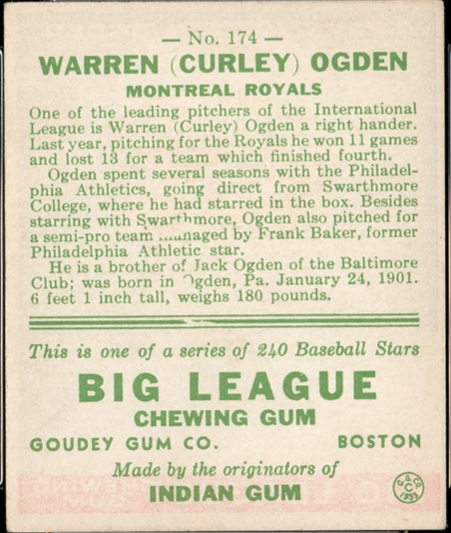 Canada and Goudey and "Canadian Goudey"
When you collect pre-WWII baseball sets, Canadian confectioner World Wide Gum (WWG) appears here and there along the journey, often linked to Goudey Gum. I first encountered it as "Canadian Goudey" in catalogs and online searches many years ago, which led me to cards like this. Within the hobby, most treat them as one entity (Goudey Gum calling the shots and WWG as their Canadian subsidiary) for card-making and collecting purposes. I think it's more nuanced. 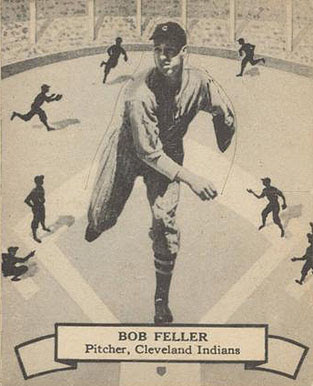 While foremost a gum and candy company, WWG released a variety of sport and non-sport card sets under that name between 1933 and 1950. 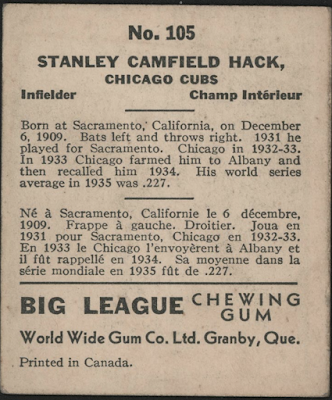 They're best known for adapting Goudey's 1933 & 1934 Big League Gum baseball sets for Canadian distribution. Some print runs added French translation to card backs, like the Ruth below. As a collector, it took me awhile to consider WWG on its own. 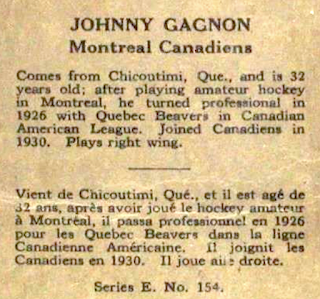 The phrase "Canadian Goudey" gets stuck in your head and yet oversimplifies the many things they created. Instead of focusing on them as Goudey's regional offshoot, there's more to say about why baseball fans in Canada wanted cards and where WWG's creative energy came from. 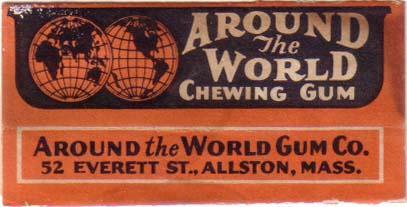 First off, "World Wide Gum" didn't mean Canada alone, at least not at first. 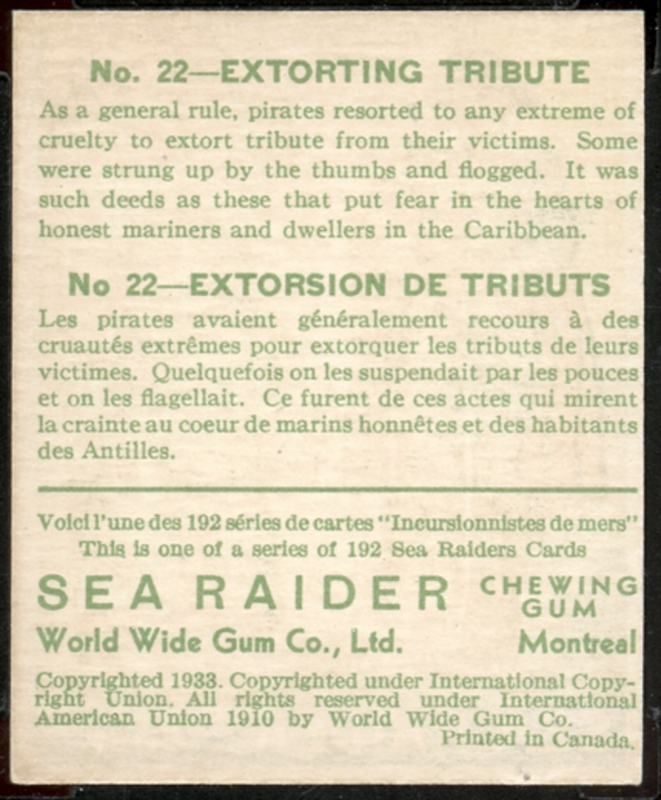 One early set (R78 Jungle Gum) placed WWG in Boston and R124/V359 Sea Raiders Gum (scans above and below) include back variations from both Boston and Montreal. Sea Raiders appears to be WWG's last set "straddling" our northern border and ensuing sets say "Printed in Canada." 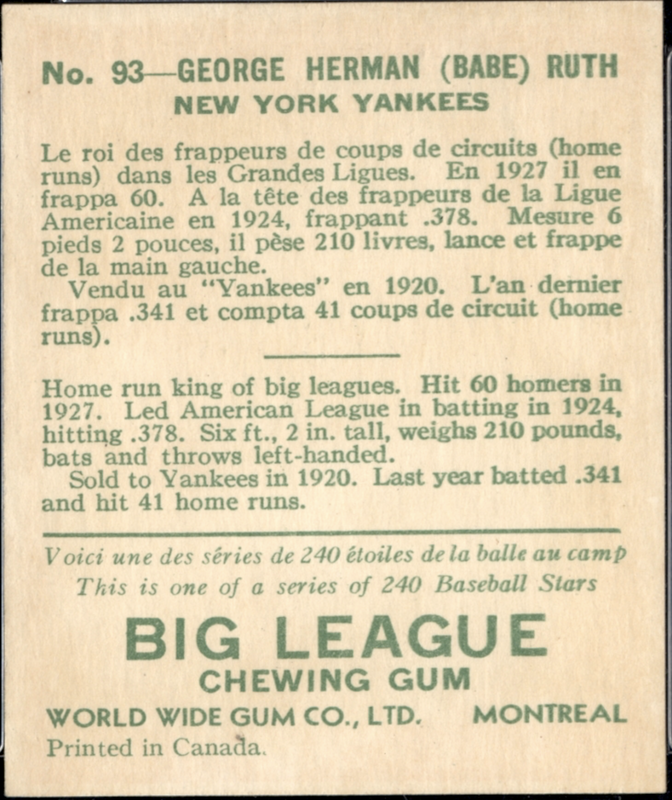 While World Wide Gum now stationed itself in Montreal, they didn't just adapt Goudey's designs like a Quebecois mimeograph. 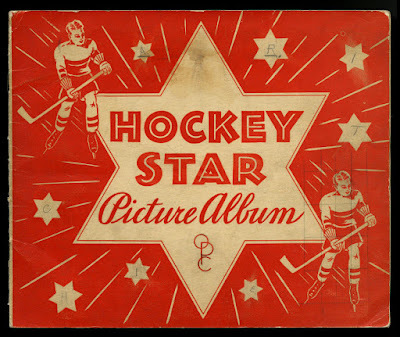 They went on to create some Canadian exclusives, including 1930s Ice Kings Gum (NHL hockey) and 1936-37 Big League Gum, a 135-card baseball set featuring both Major League and International League players. I dive into those later. On a business level, WWG outlived Goudey Gum (RIP 1962) by more than a decade. You can find Canadian newspaper articles about WWG's candy business into the 1970s, showing longevity Goudey couldn't match. 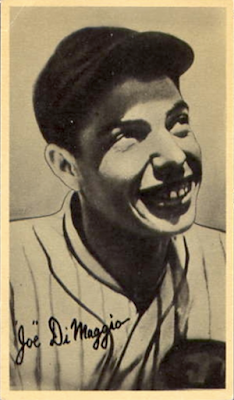 Goudey Gum drew the curtain on its card business in the late 1940s. WWG's last trading card set proved to be 1950 V362 Big League Stars, an International League issue produced without any apparent Goudey involvement. Goudey Gum's founder, Enos Goudey, moved to America from his native Nova Scotia in the 19th century and turned extensive manufacturing and candy-making experience into a successful business selling low-cost sweets -- even nicknamed The Penny Gum King of America -- by the 1920s. Of his many brands, Oh Boy! proved Goudey Gum's most enduring. Goudey Gum published one set of trading cards under this Oh Boy! name. 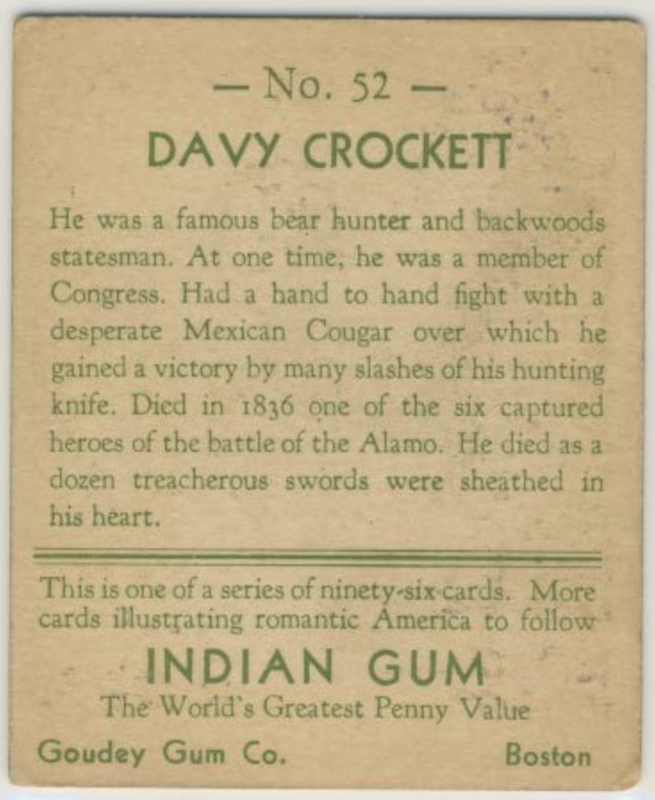 It appears they worked around the destructive stickiness of 1920s-era gum recipes by selling their postcard-sized set from vending machines and store counters, not in commingled gum packs. 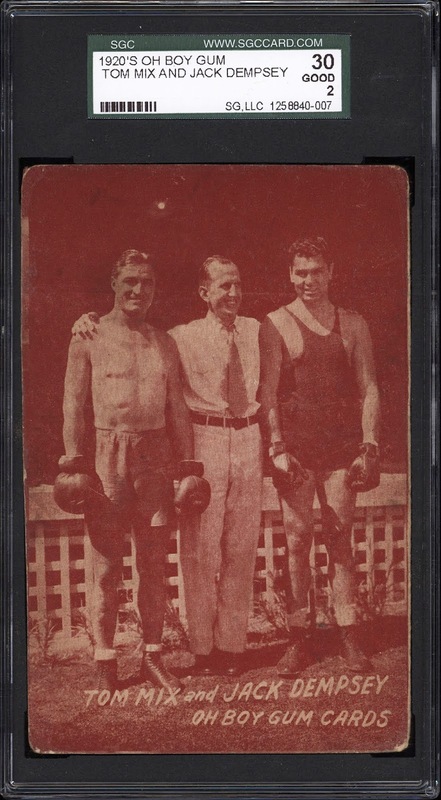 Jack Dempsey became Goudey's first on-card athlete, shown here training with actor Tom Mix for a boxing movie. This design's close to those produced by Exhibit Supply Co. of Chicago for several decades. Perhaps Exhibit's print facilities made these Oh Boy! cards via Goudey's Chicago connection? While their 1920s production details aren't known today, smaller card companies often designed sets in one office and contracted them out to a larger lithographer. Exhibit Supply could've fit the bill as its printer. 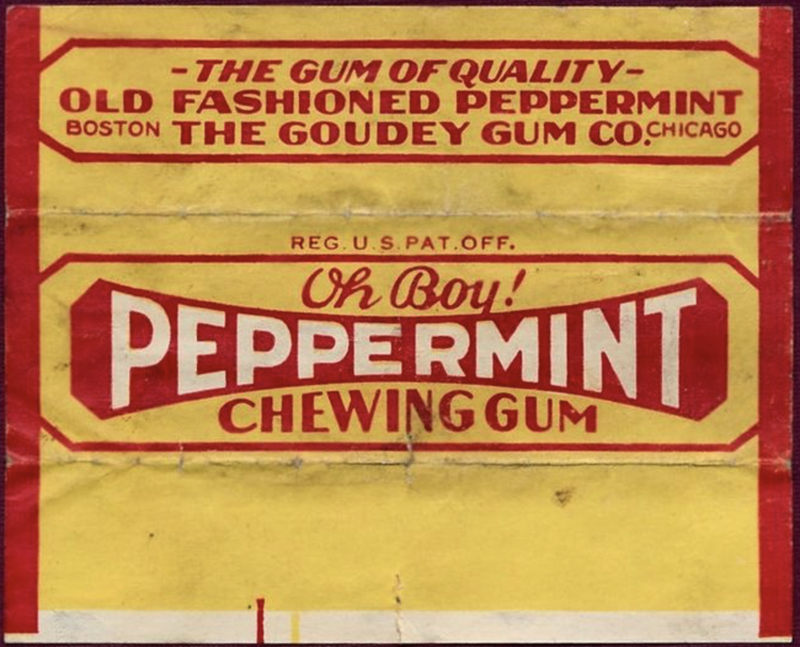 Enos Goudey released gum products under several corporate aliases during his time as company president and "52 Everett St." meant Goudey's Boston production facilities. World Wide Gum distributed several of these gum brands in Canada, so we know the companies shared a business relationship prior to trading cards, at least as gum partners. Based on my own recent research, I propose some updates for V355 Big League Gum later in this article. Now in his late 60s, Enos sold Goudey Gum in 1932 to a family relative connected to the Corning manufacturing empire. I wonder if he felt motivated to exit the business and enjoy retirement by the sudden death of 70 year-old William Wrigley, Jr. -- titan of the gum business and owner of Chicago's Cubs -- in January of that year. Though Enos remained available as advisor to Goudey Gum, his successors deserve credit for making its card business take off. Early 1930s gum formulations allowed for safer packaging with paper and their first hit came in late 1932 with Indian Gum cards. 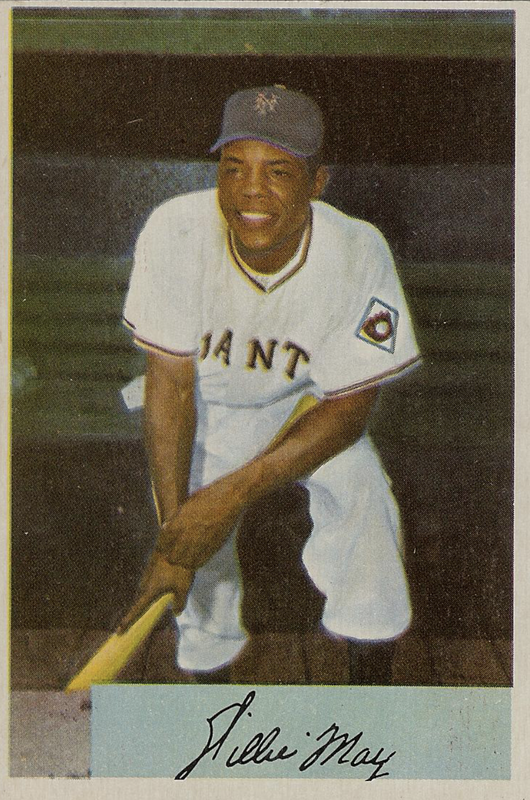 PSA profiles this set's nuances well and the company experimented with production and marketing approaches soon used in baseball sets, such as gap numbering, in-store wrapper exchanges, and mail-in add-ons. Indian Gum back designs echo competing non-sport sets like 1932 R139 "Soldier Cards" and 1932 R114 "American Heroes," both from other New England companies. It's hard to know who "invented" this back layout, as almost all sets of the era used it. Note that PSA and others differ over Indian Gum's launch date, 1932 vs. 1933. I use 1932 for two reasons. First, an original Goudey collector recalled it as the "fall of 1932" in his 1970 notes on buying their sets. Second, every Big League Gum card notes "...by the originators of Indian Gum" on the back. I doubt an all-new baseball set would tout another product made just weeks earlier. With Big League Gum hitting the streets in April, logic pushes Indian Gum back to at least late 1932. 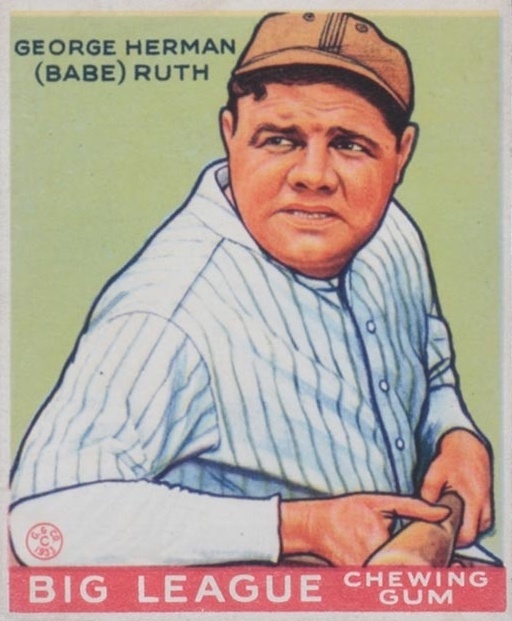 As reflected (in part) by his four 1933 Big League Gum cards, Babe Ruth remained the sport's top draw, and I've already written about Goudey featuring him on their All-Star redemption promos. All-Star Aside: Star-laden "benefit baseball games" already existed in the mold of 1911's Addie Joss game. Chicago's 1933 game added something new: nationwide fan voting for starting rosters via newspaper-printed, mail-in ballot. (Read MLB.com's "All-Star fan vote has storied history" for how that worked, kind of.) American and National Leagues canceled their games scheduled for July 6, more-or-less "blessing" that game date and freeing all elected players to participate. 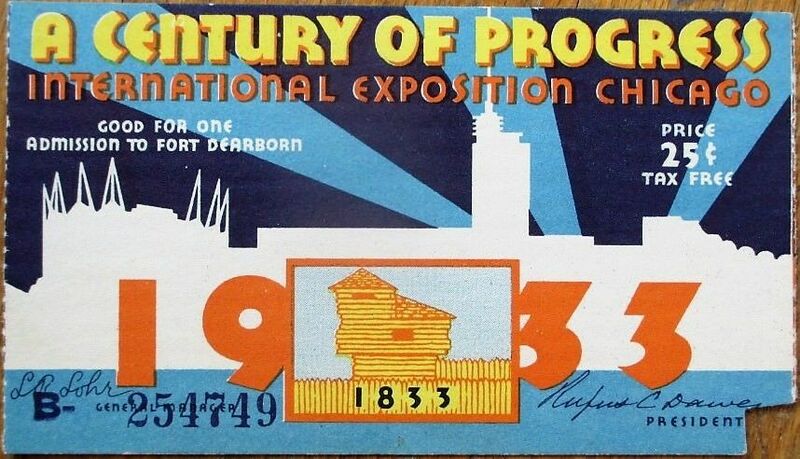 Chicago linked this "Game of the Century" to its 1933-34 Century of Progress World's Fair. 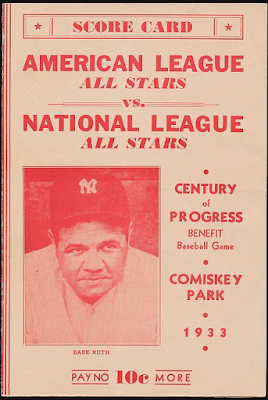 Its nationwide wave of pregame hype proved a turning point for modern All-Star Games as public spectacle and baseball players as product pitchmen. 1933 sales alone would exceed $23 million in today's money. 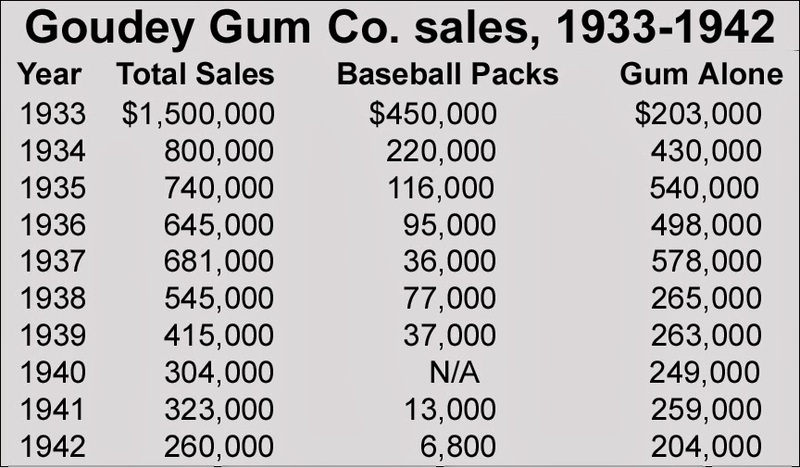 It's not clear whether Goudey's revenue covered products sold by partners (e.g., World Wide Gum). It should include their non-sport sets like Indian Gum. However you count it, their rush of cash meant changes for employees and competition alike. 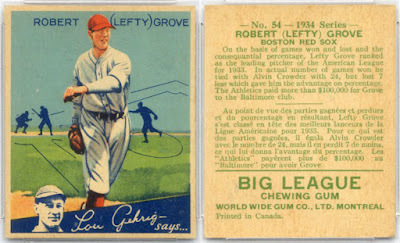 Goudey's first Big League Gum set, with 239 cards sold in 1933, stood out as our hobby's biggest since tobacco companies stopped pairing cigarettes and cards in 1911. Their last 24-card series came out following New York's Series win, featuring twelve world champion Giants and twelve AL pennant-winning Washington Senators. Here's the order of all ten Goudey sheets. 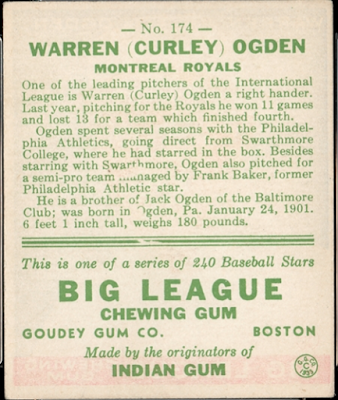 Thanks to Kevin Glew's set summary at PSA for this sheet breakdown and Jasoncards' Minor Leaguers of the 1933 Goudey set for details about Goudey's 15 International League players, which included Montreal's own Curley Ogden on sheet seven. 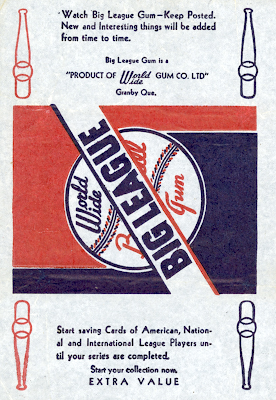 World Wide Gum adapted 1933 Big League Gum for Canada from a subset of Goudey's American-made sheets. 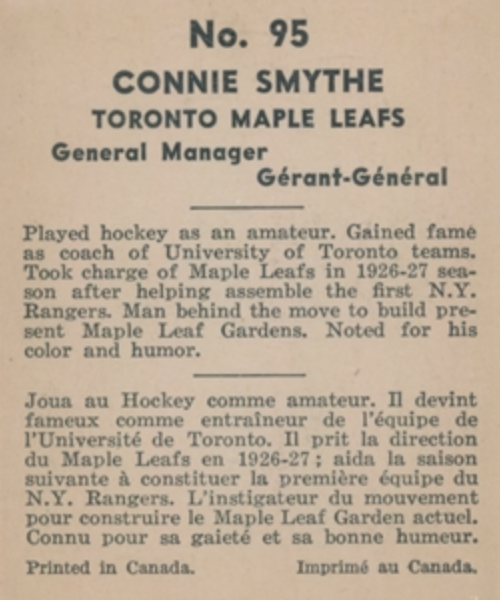 They had the opportunity to use International League players who'd be familiar to Montreal Royals and Toronto Maple Leafs fans. 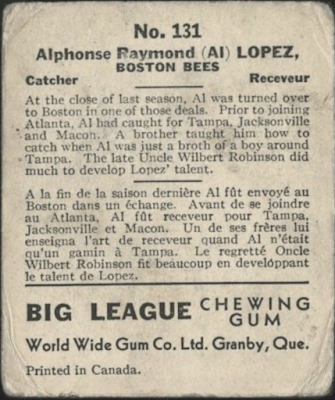 Alas, WWG built its Big League Gum from four Goudey series (1, 2 3, and 6) that didn't contain any minor leaguers, so no Toronto and no Montreal, at least not in 1933 gum packs. WWG's first two Canadian sheets split #1-48 in half. If you're feeling flush, BMWCards will sell you the second one. 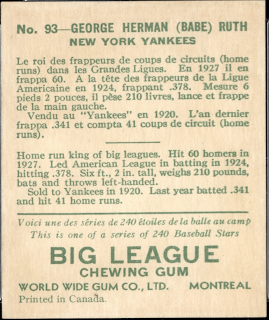 World Wide Gum's use of Goudey's sheet six and a reduction in extra-printed Ruth cards meant renumbering about half the Canadian set compared to America's version, so collectors of both will notice differences. 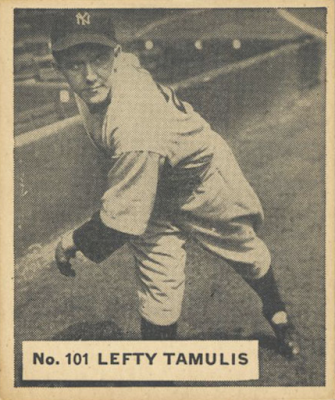 Read Jasoncards' An alternate history of 1933 Goudey for good thoughts on how that happened. WWG's third sheet, with Gehrig at #55, sold at REA in 2015. 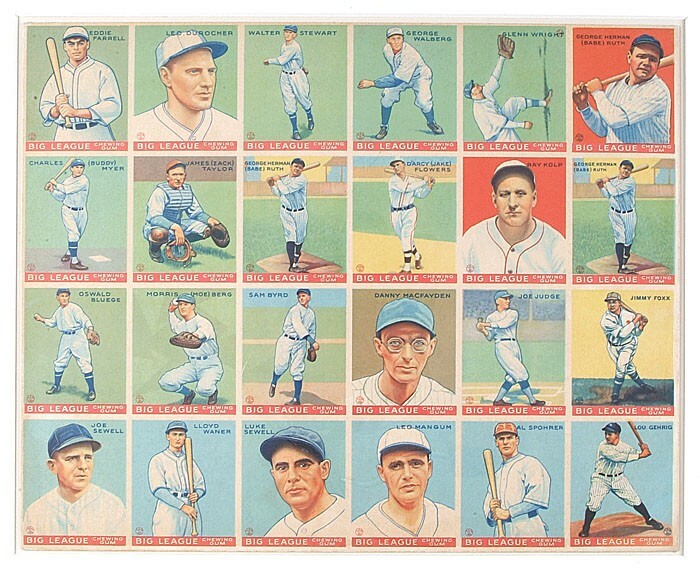 WWG's fourth sheet with extra-printed #80 Ruth and #55 Gehrig cards, sold by REA in 2013. I bet World Wide Gum created its four-sheet Big League Gum set before All-Star Game hype reached its fever pitch. 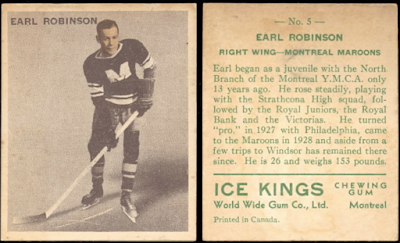 While Goudey went on to ride that wave through another six sheets of players in America, WWG switched to designing their 72-card 1933-34 V357 Ice Kings Gum hockey set, a Canadian exclusive. 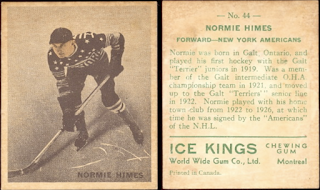 Based on dates for that year's NHL season (November 1933 to April 1934), Ice Kings went to printers by October at the latest. So why end WWG's baseball after four sheets? It seems straightforward, if (as a new-ish card seller) they could produce just one set at a time. Canadians do love their hockey, so it made sense to get NHL cards ready to go. For two full years, Goudey did great artistic work on Big League Gum, Sport Kings Gum, and other non-sport sets. Then their card creativity fell off the table. From 1935 on, it's just repeated images from 1933 and 1934 sets, a shift to black-and-white, and ever-cheaper production. Where did their artistry go? 1936 Big League Gum, aka, "The Grey Depression"
I think Goudey lost both its talent and a need for baseball card innovation. Recall that Enos Goudey sold his business in 1932. When founders sell, executives often leave with their personal proceeds and other employees change jobs to avoid conflicts with new ownership. Goudey treasurer Harold DeLong, for example, created his own gum label and used it to release this 24-card baseball set in late 1933. While a minor set by size and collector interest, DeLong Gum's back design provides a missing link to the better-known 1934 Diamond Stars Gum set. Recognize that "Austen Lake" byline? 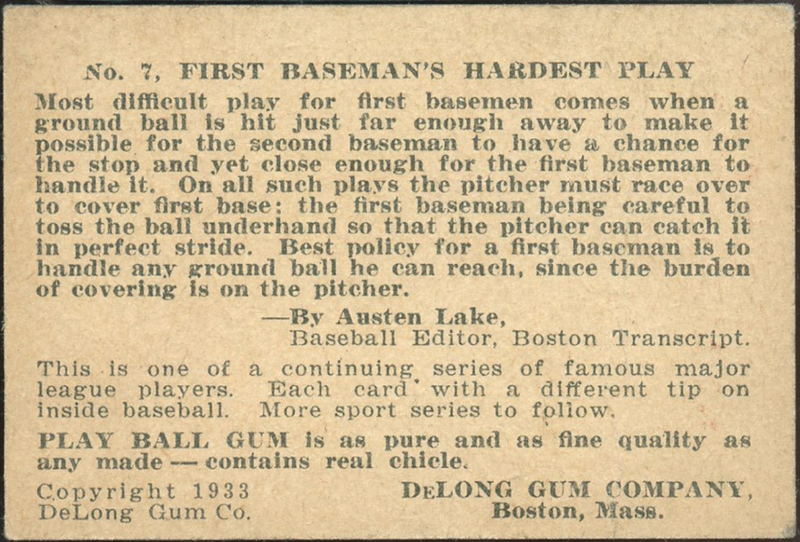 Goudey's new competition, National Chicle, signed Austen Lake to write their Diamond Stars Gum card backs, less than one year removed from his work on DeLong Gum. 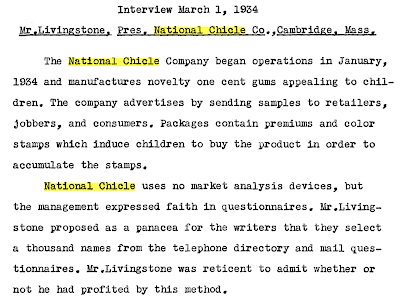 How did National Chicle itself get off the ground? 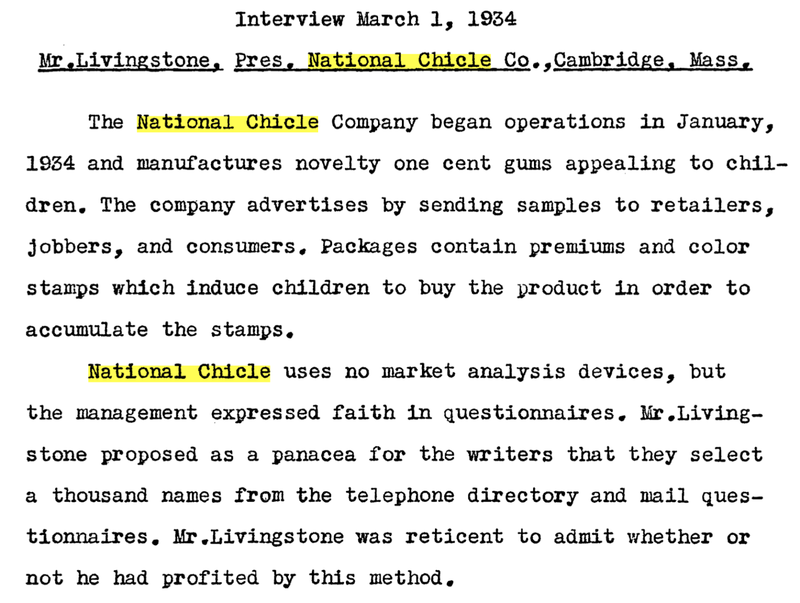 In late 1933, ex-Goudey man Alvin Livingstone led a group of fellow former employees to found a gum card business under that new company name. An MIT business student interviewed Alvin not long after they started up and asked about his approach to market research, with cagey results. 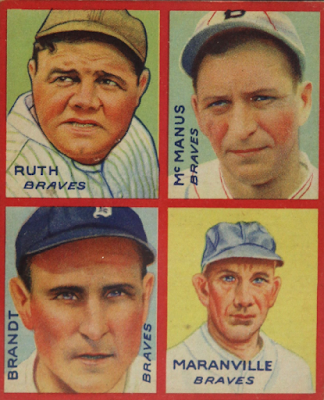 I'm not sure we can prove whether Goudey's card artists followed Livingstone to National Chicle. Based on the excellent artwork on Sky Birds Gum and Diamond Stars Gum sets, I think it likely. Even National Chicle's photographic set, Batter-Up Gum, went the extra mile by adding a die-cut, stand-up panel cut to each player's silhouette. 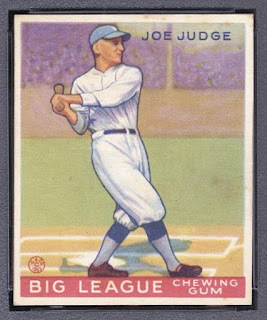 Compare this to Goudey's reuse of 1933-34 card images for 1935's 4-in-1 version of Big League Gum. Not a great card to unwrap if you're hoping for pictures you haven't seen before. 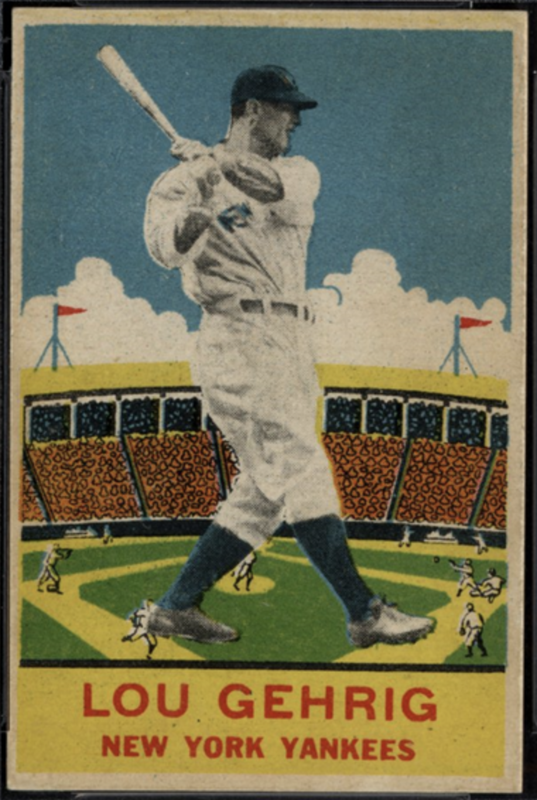 Goudey itself more than doubled gum revenue from 1933 to 1935, while baseball revenue dropped to a fraction of its 1933 peak. In addition to losing creative talent to DeLong and National Chicle, their market perspective seemed to change. I imagine them questioning whether they needed to keep making so many cards when gum alone sold so well. 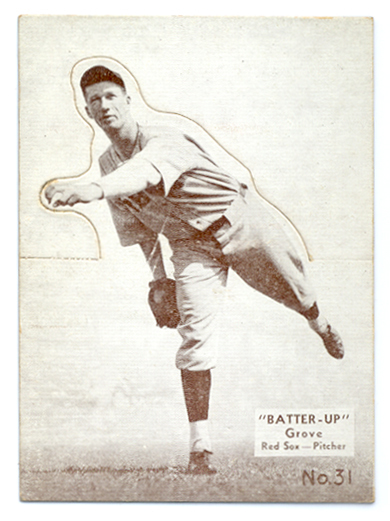 While Goudey's fortunes changed in America, interest continued to bubble up north. Let's return to World Wide Gum and its own competitive challenges. Even before Goudey Gum threw down with National Chicle in 1934, World Wide Gum faced off against another card maker known to most modern collectors: O-Pee-Chee. The same company who'd partner on baseball with Topps decades later first entered Canada's hockey card market, when both OPC and WWG produced NHL sets for 1933-34. 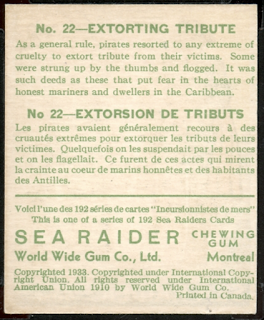 World Wide Gum's effort featured tinted photos and superior posing. O-Pee-Chee's set took a more "school yearbook" approach. So yearbook-y they created albums to store and display your hockey heroes. While WWG took a break after that first year of Ice Kings, OPC persisted, adding another 24-48 cards each successive NHL season. Their five series catalog as V304-A (1933-34) to V304-E (1937-38). All OPC hockey albums I've seen hold 72 cards, so would've come out after V304-B. Here's their full Hockey Stars Gum wrapper lineup. On the business side of things, O-Pee-Chee's Wikipedia page says they "operated mainly at a loss during the Depression." 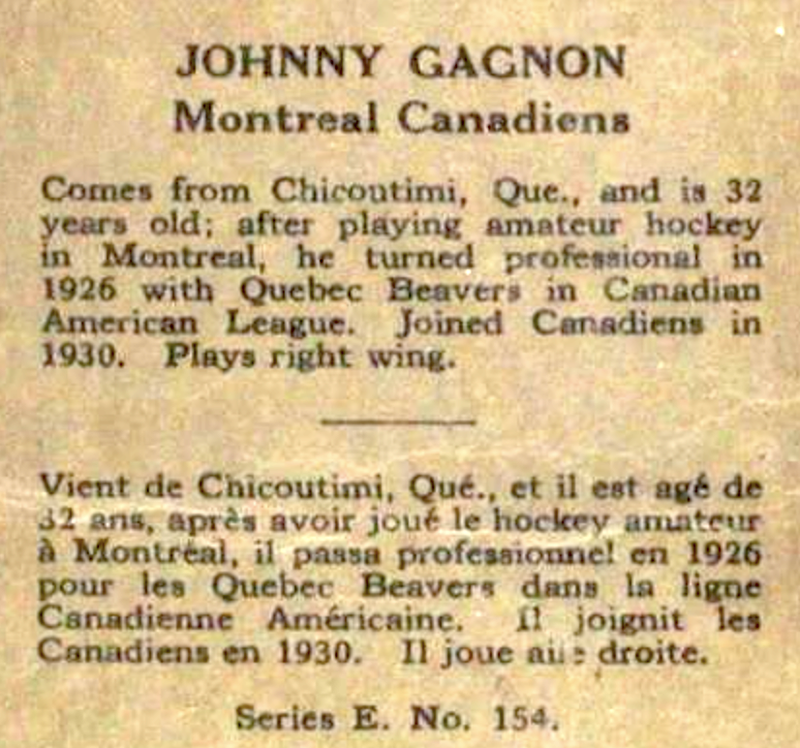 Economic woes could explain why WWG itself dropped hockey between 1934 and 1937, while OPC continued to soldier on, despite an uncertain future. Stateside, Goudey released a pair of lower-cost 1936 sets, Big League Gum "game backs" (25 players, cataloged R322) and R314 premiums (~200 players, larger photos on thinner paper). 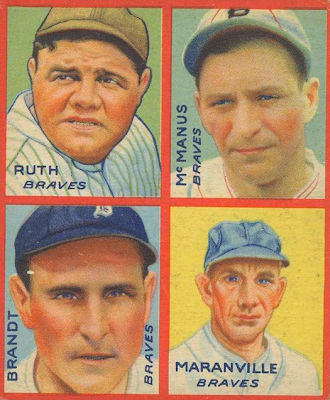 Goudey cropped all their R322s from identical, larger R314 images. Kids bought gum packs and swapped their empty wrappers for an R314 premium in the store itself. Not sure how pleased kids would be to get some of those same pictures twice. 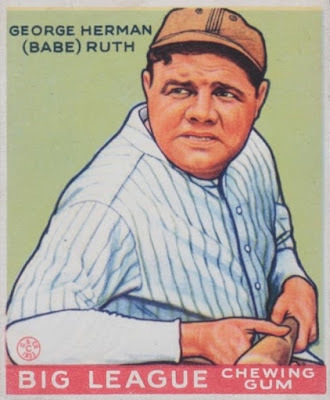 Based on available quantities in our hobby today, I think Goudey scuttled R322 card production mid-year, yet continued to offer R314 premiums in shops for some time after. Eagle-eyed collectors can break this "R314" set down further. 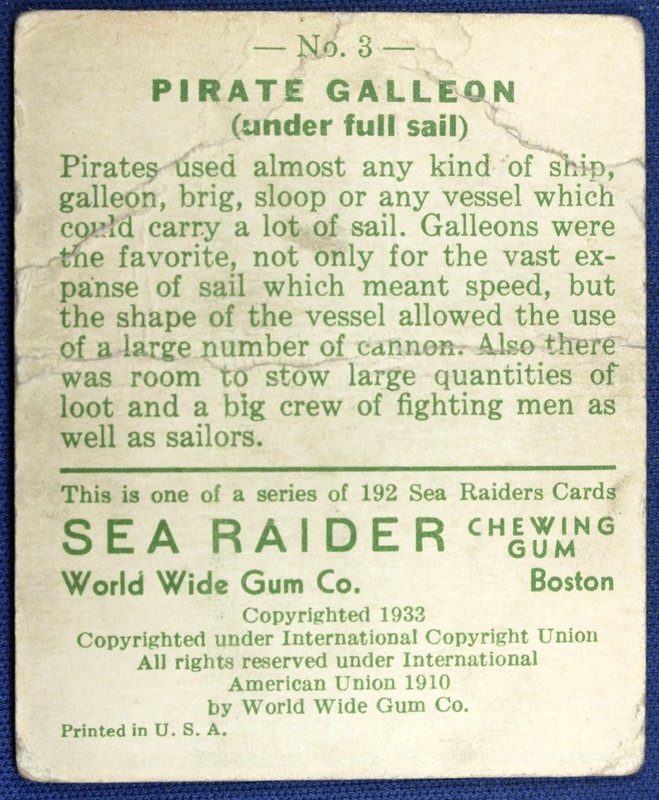 While some catalogs delineate up to five "R314" subsets, I agree with Prewarcards.com at least two (and perhaps four) of those types belong under V352 as World Wide Gum issues. Anything lacking "Litho in U.S.A." appears fair game for Canada-only or shared American/Canadian distribution. R314 Type 2 (V352?) premium, no "Litho in U.S.A"
If you search for R314/V352 information, not everyone agrees on its number of "sets" (based on design and print differences), number of cards in each set, and country of origin. Still room to improve what we know on this one. I think just as Goudey printed R314 premiums to support 1930s Big League Gum sales in the USA, WWG used these non-USA premiums to support their own set of MLB and International League players. Let's check that out now. Starting in 1936, Canadian fans received what Americans hadn't since 1934: a sizable set of new baseball card photos, albeit sans colour. 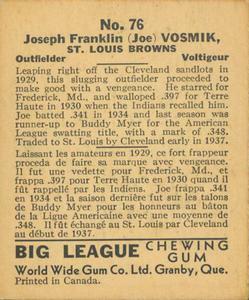 Most catalogs date V355 Big League Gum as 1936, which tells just half the story. 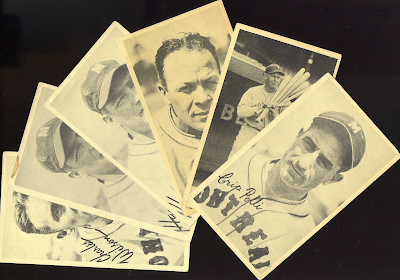 If you read its card backs in detail, WWG wrote 20+ cards based on events during or after the 1936 season. (You can check my card-by-card work in TradingCardDB's set gallery.) 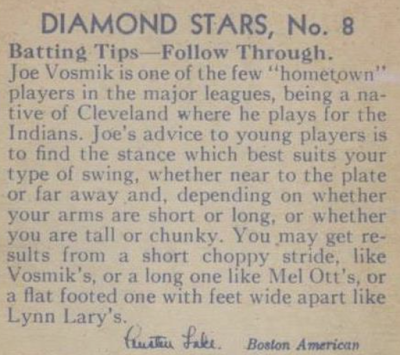 As one example, #76 Vosmik says, "Traded to St. Louis by Cleveland early in 1937." 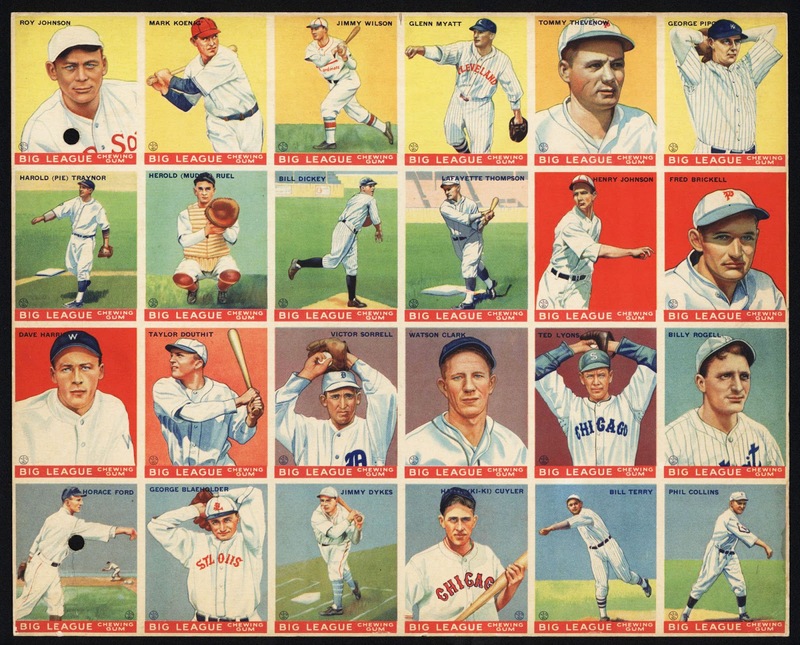 When I rule the world, card catalogs will call this a 1936-37 set, just as they date multi-year efforts like National Chicle's Diamond Stars Gum and Batter-Up Gum to 1934-36. They all published cards across more than one year. Card backs also imply WWG planned from the start for a two-part, two-year release. 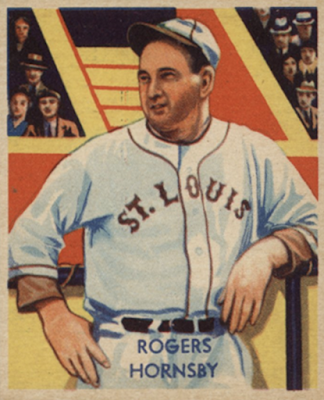 Some "high-number" cards (for example, #131 Al Lopez) refer to 1935 events as "last season," so would've come out, or been written to come out, in 1936. As mentioned above, more than 20 cards refer to late 1936 events, so at least one series, and perhaps two, hit the streets in 1937. World Wide Gum wrappers asked collectors to "Start saving Cards of American, National and International League Players until your series are completed." Sneaky stuff, when they know you can't complete their numerical run until 1937. 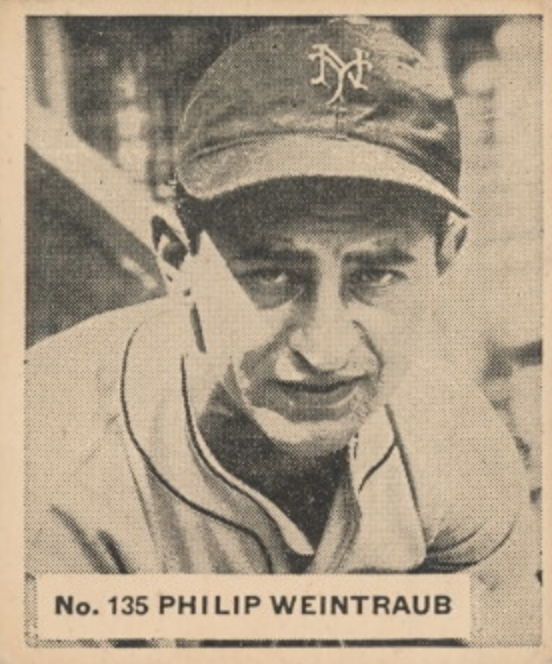 A single (purported) 1936-37 short print exists, #135 Philip Weintraub, with no clear explanation for its scarcity. As the set's last card, print difficulties with his sheet location could've damaged available cards. WWG might've also found reason to pull his card partway through distribution. PSA's graded twenty #135 examples, so it's not unheard of to locate, just pricy when you do. World Wide Gum designed its cards in Quebec, so I think local baseball events figure in its creation. 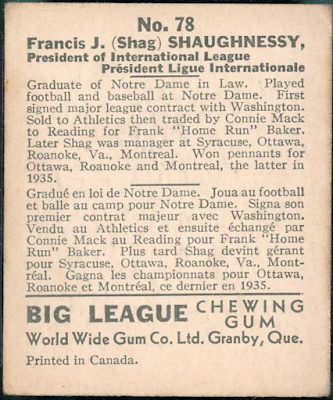 In 1935, Frank "Shag" O'Shaughnessy managed their Montreal Royals to the International League playoffs. Despite Montreal's title loss to New York rivals Syracuse, we'd expect local baseball interest to hit its highest point in several years. 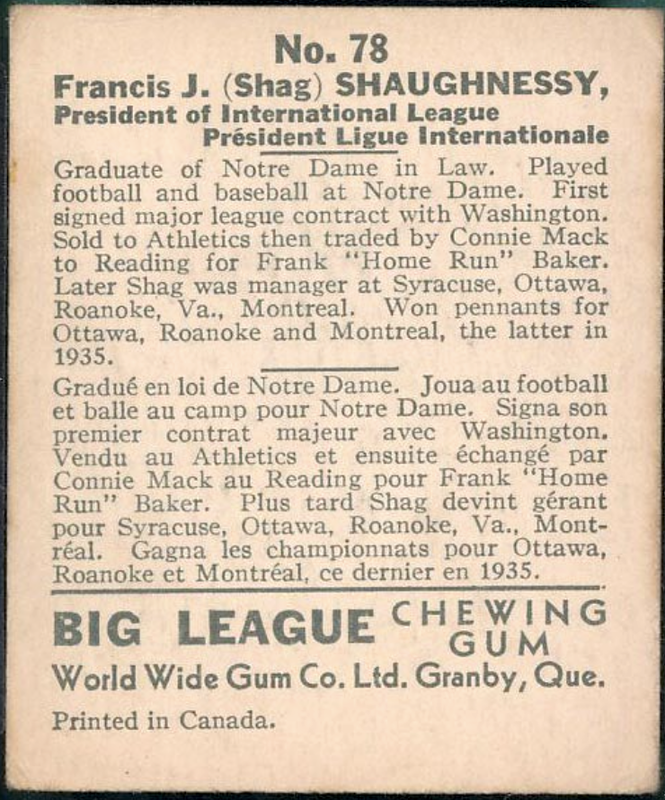 Shag's own card came out following his mid-1936 move from Montreal manager to the IL President's office. 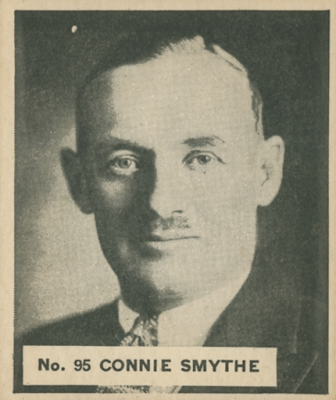 As part of a lifelong connection to sports, he'd earlier invented the eponymous Shaughnessy playoff system, implemented by the International League and still used in various leagues and sports around the world. As mentioned earlier, WWG's 1933 and 1934 baseball sets stopped short of including Canadian (International League) minor leaguers, perhaps in deference to their upcoming Ice Kings Gum hockey set. 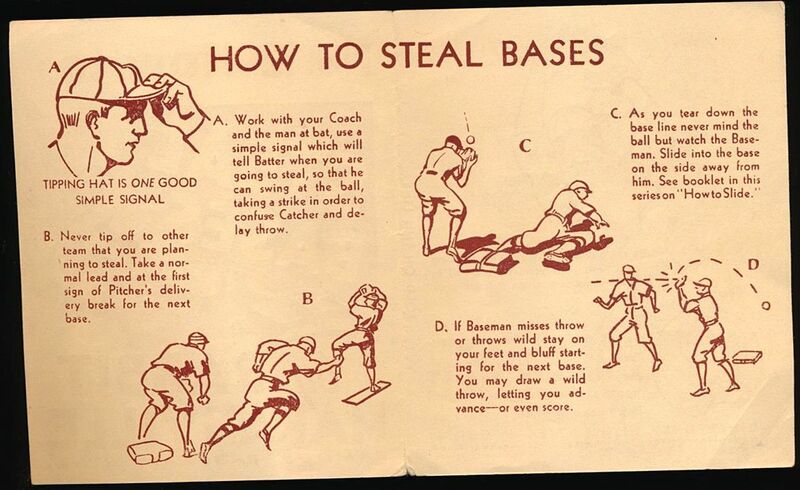 This 1936-37 set didn't miss that opportunity and included 26 International Leaguers, 14 of those from Montreal alone. I think local representation went beyond Big League Gum itself. Remember one R314/V352 premium ("R314 Type 5," shown above) contains International League players. It's almost certain Canadian candy stores used them as a wrapper swap bonus for 1937's Big League Gum packs. While we've uncovered this set's (two) years of issue, its print layout remains a mystery. 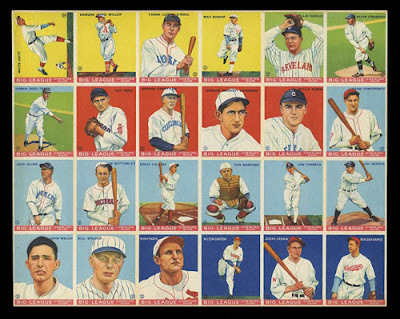 Unlike 1933 and 1934 Big League Gum, no 1936-37 uncut sheets exist in the hobby today, so we might never know for sure. Lacking better info, I propose one of these options. 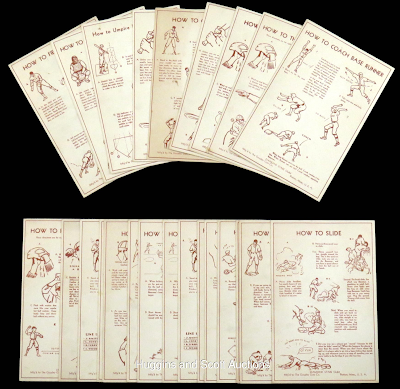 Goudey and WWG used 4x6 sheets for many other sets, so I give an edge to that one and its double-prints. 1936-37 remains so scarce, it's hard to prove who WWG would extra-print. Lou Gehrig, perhaps? PSA's V355 population report contains less than ten registered cards for many numbers and I'd like more data to draw conclusions. We already know Goudey lost card talent to DeLong and National Chicle after 1933. For those willing to move north, World Wide Gum represents another potential landing spot and, with some evidence, I think so did O-Pee-Chee. O-Pee-Chee's hockey sets didn't remain static, even as they had a market more-or-less to themselves after World Wide Gum stepped back from Ice Kings Gum. 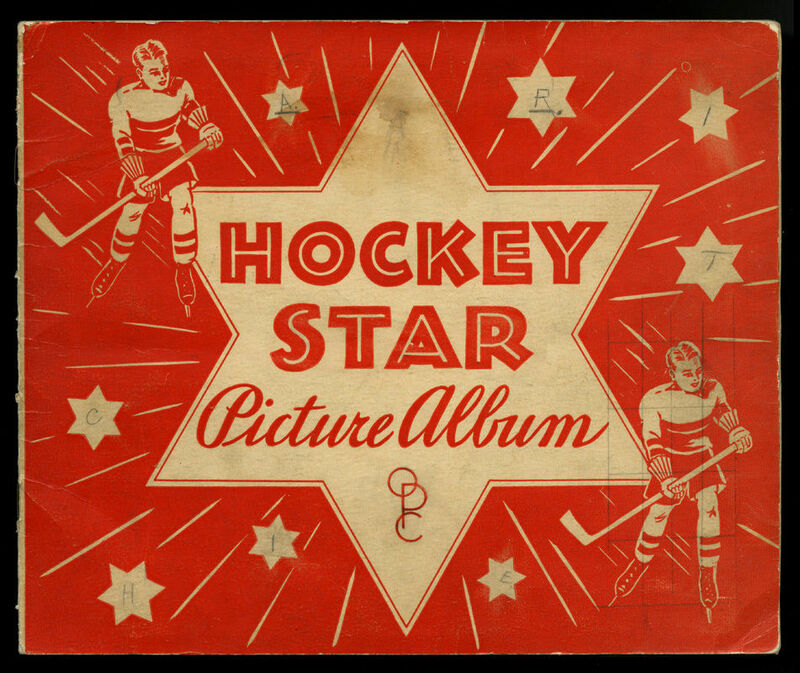 If you like 1934-36 Batter-Up Gum like I do, you'll recognize a feature of this OPC 1936-37 Hockey Stars set. To refresh our brains and eyes, here's 1934-36 National Chicle Batter-Up again, sporting a similar haircut die-cut, so kids could fold it down and stand their players. Since we now know World Wide Gum published part of its Big League Gum set in 1937, this again made them direct competitors to OPC. 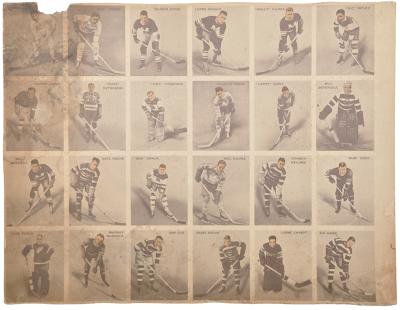 Back in 1933, WWG followed their baseball set with 1933-34 Ice Kings hockey. History repeated itself with this lookalike, 135-player set (catalogued V356) for the NHL 1937-38 season. It's heavy on close-up portraits and full of names with long-term significance. 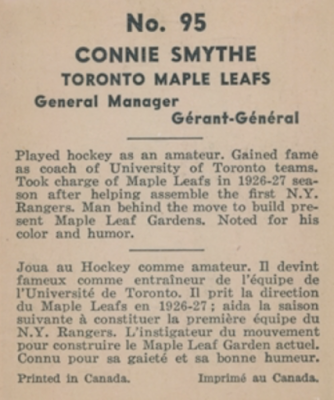 World Wide Gum's hockey set echos all the key elements of 1936-37 Big League Gum, except a company byline. Why WWG left its name off card backs qualifies as a minor mystery and, lacking wrappers to work from, I'm not sure how they packaged and advertised this specific issue. 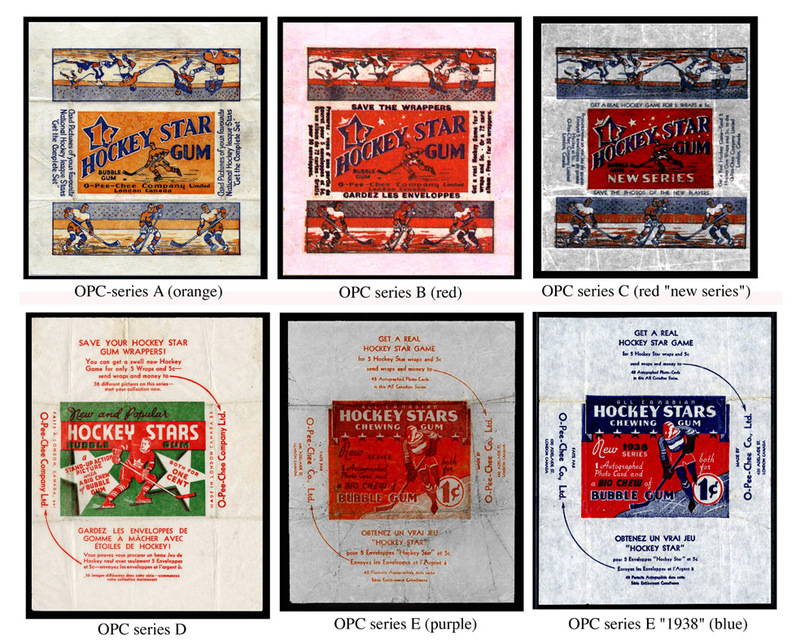 O-Pee-Chee's 1930s hockey sets skated on uninterrupted, reaching series V304-E by 1937-38, so they once again competed with World Wide Gum for NHL fans that year. I enjoy the geometry of that blue-on-grey design and it's a nice step up from WWG's staid black-and-white portraits. 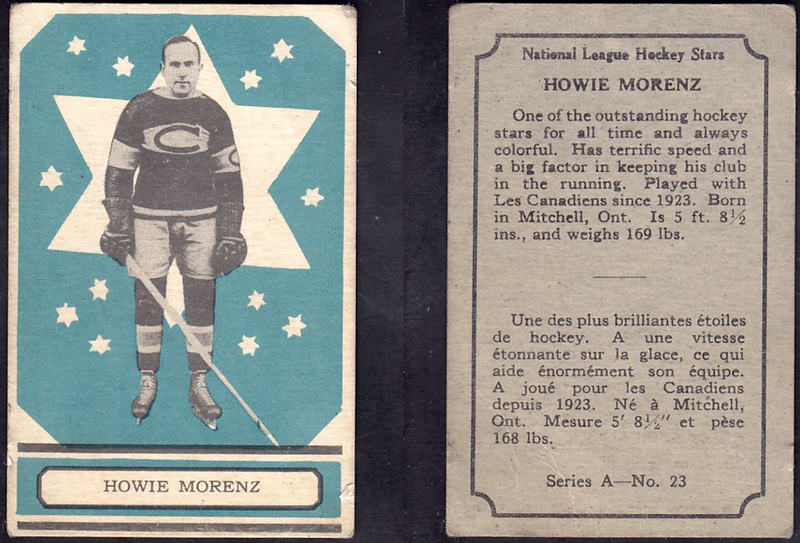 If you're choosing baseball and hockey sets to collect by look alone, OPC outdid their competition twice. 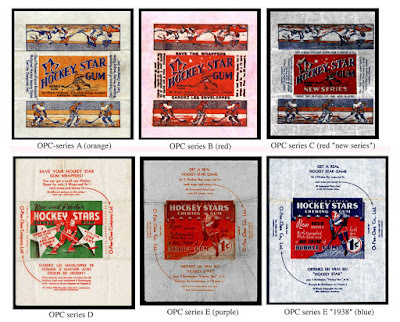 While there's no clear business agreement linking National Chicle's Batter-Up Gum design to O-Pee-Chee's use of die-cuts in their 1936-37 hockey and 1937 baseball sets, you can see the path of inspiration. This raises the question: are we're looking at cross-industry influence or something more direct? My theory's Chicle sold their die-cut designs to OPC outright in 1936 to raise some cash and stave off financial collapse. 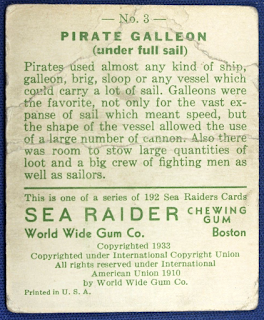 It's notable, at least to me, that after Goudey Gum acquired National Chicle's post-bankruptcy "remainders" in early 1937, some Chicle designs reappeared under the Goudey name over the next two years. None of those American retreads included die-cuts, while O-Pee-Chee produced both hockey and baseball sets with a fold-down flap in the same time frame. "Canadian Goudey" turns out to be a big umbrella once opened! 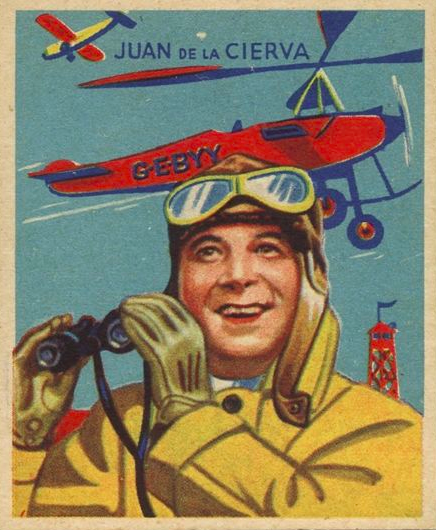 We've now seen connections and divergence between quite a few 1930s sets, thanks to an array of Goudey Gum's own work and spreading North American influence. 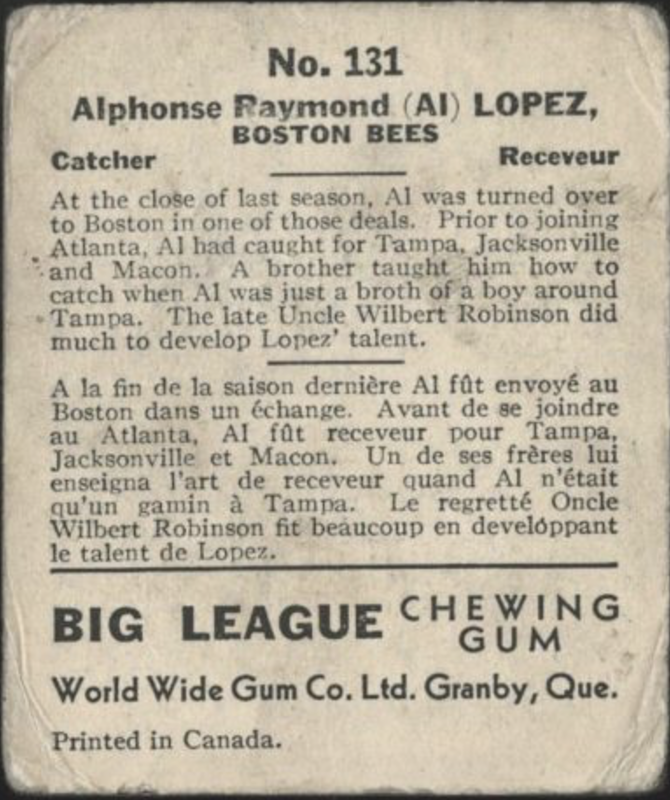 I'm going to push its envelope a bit further by showing what Goudey recycled from National Chicle after their 1937 bankruptcy sale to try and explain how World Wide Gum reappeared in Boston not long after. Rabbit Maranville spent multiple stints in Boston and finished his long MLB career there in 1935. 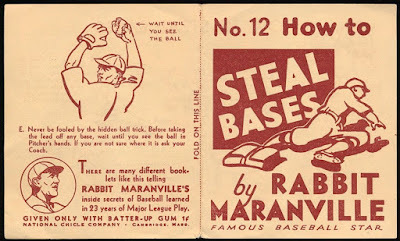 I think his local stature and connections made Rabbit an easy choice for Chicle's set of "how to" booklets inserted in 1936 packs of Batter-Up Gum. More germane to our Goudey discussion, his advice reappeared on backs of 1939 R303 premiums, about two years after National Chicle's bankruptcy. Using these on R303s gave Goudey baseball content without needing to create something new and they even dropped Rabbit's name, saving any endorsement fees. My next image represents an enigma, isn't well-known to the hobby, and remains open to theories. It's a Diamond Stars Gum penny wrapper with World Wide Gum of Boston's name attached. American, Canadian, and competitive worlds collide! Since we've looked at a lot of surrounding 1930s circumstances by now, I propose this to explain this wrapper's existence. 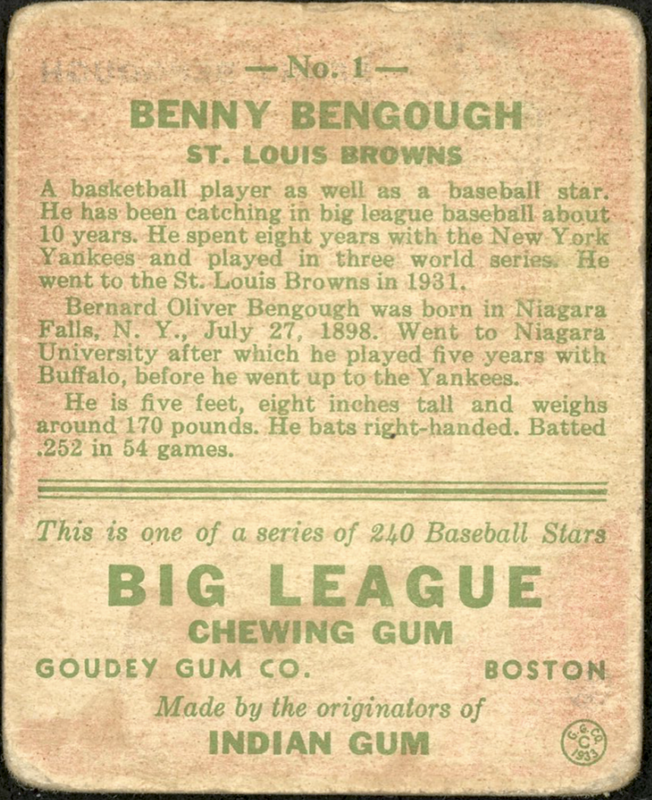 Goudey's purchase of National Chicle's remainders included some quantity of printed, unsold 1934-36 Diamond Stars Gum cards and existing distribution contracts. 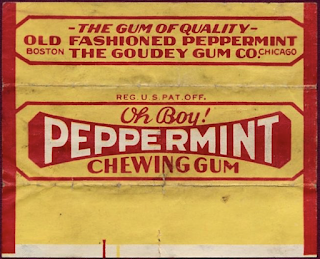 Rather than throw away existing stock and potential revenue, Goudey resurrected World Wide Gum's American entity, printed these simple wrappers, and sold Chicle's leftover cards in them. This allowed simultaneous sale of both 1938 Big League Gum and leftover Diamond Stars Gum without using the Goudey name twice. Buyers exchanged these wrappers for R303 "how to" premiums, explaining why they call out "Diamond Stars Gum" on their backs. 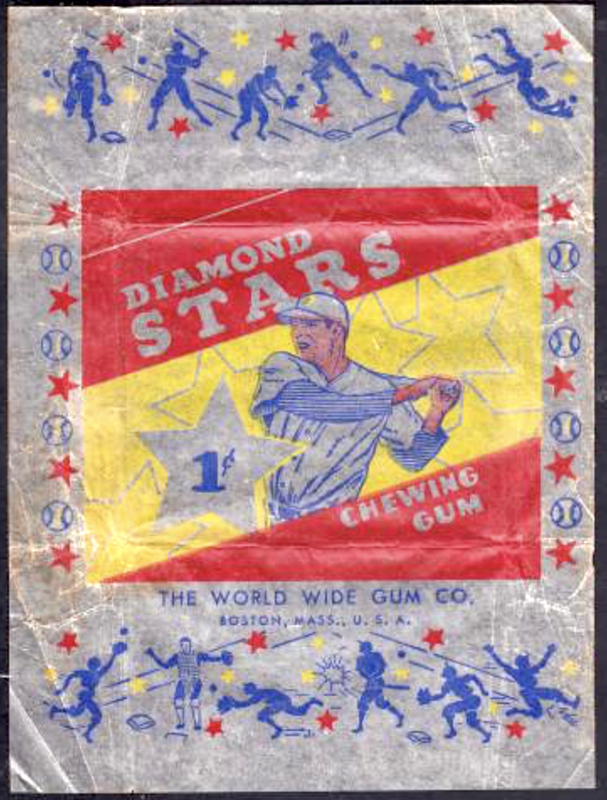 As I've never seen this World Wide Gum Diamond Stars wrapper addressed in detail, alternate theories and timelines are welcome! 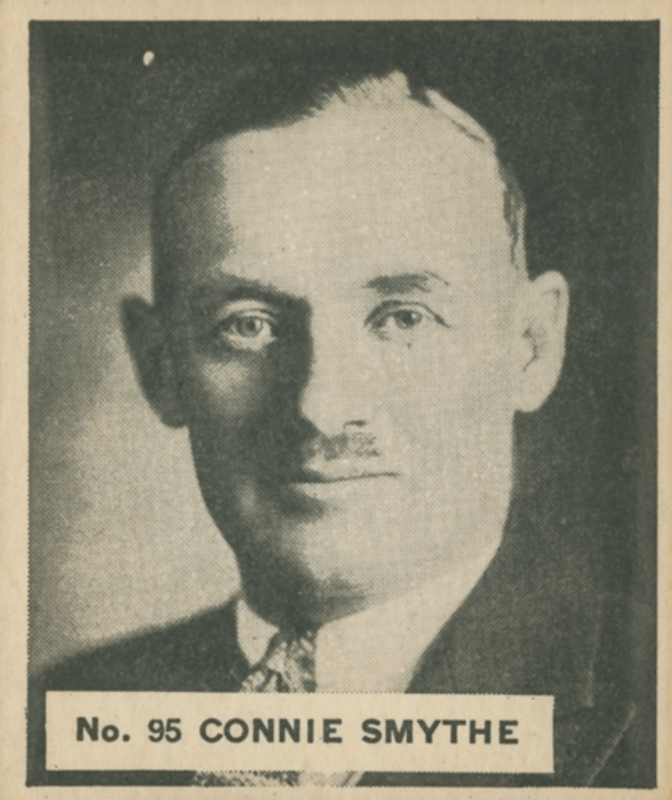 Wrapping up Canada, Goudey, and "Canadian Goudey"
Thanks for sticking with me to the end, as it's the most I've written about Goudey, World Wide Gum, and their 1930s competition. (At least, so far.) By this point, don't feel bad if your brain's dripping out your ears in a surreal, vintage, colorful way. While there's a lot more to say about each company's card sets and corporate histories, I hope you picked up several new things that help fit them all together. Let's look at the takeaways again. 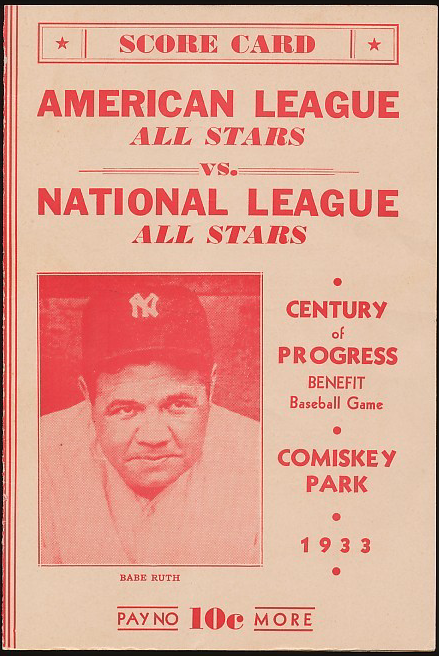 Fan excitement around Chicago's 1933 All-Star Game? It was there, in spades. Goudey Gum's 1933 card-making talent? For explicable business reasons, it left and became Goudey's own competition. World Wide Gum's contributions to trading cards? They went well beyond 1933 Goudey mimicry. 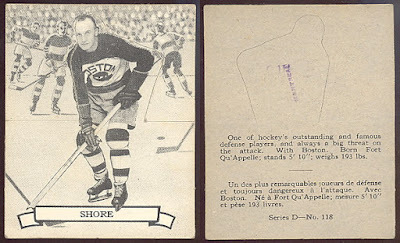 Now that you know, I hope I don't need to start competing with you all to find beat up 1937 hockey cards. 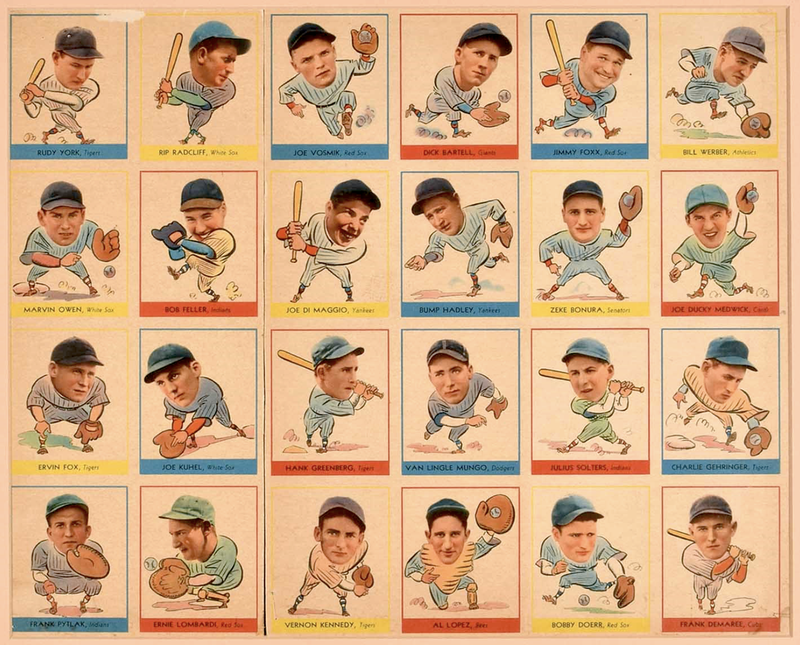 WWG's "1936" baseball set? It's in fact a two-year, 1936-37 release. O-Pee-Chee's role in all this? They published innovative sets during a poor economy and pushed against WWG in both baseball and hockey. Their prewar cards deserve more attention than they get. 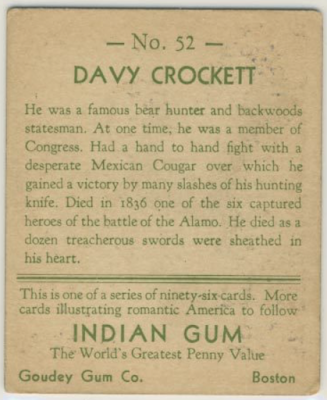 Despite all that mid-1930s drama within our gum card industry, the decade ended a lot like like it started, with Goudey surviving multiple challenges at candy store counters, and coming out ahead of (or at least surviving) the Great Depression. 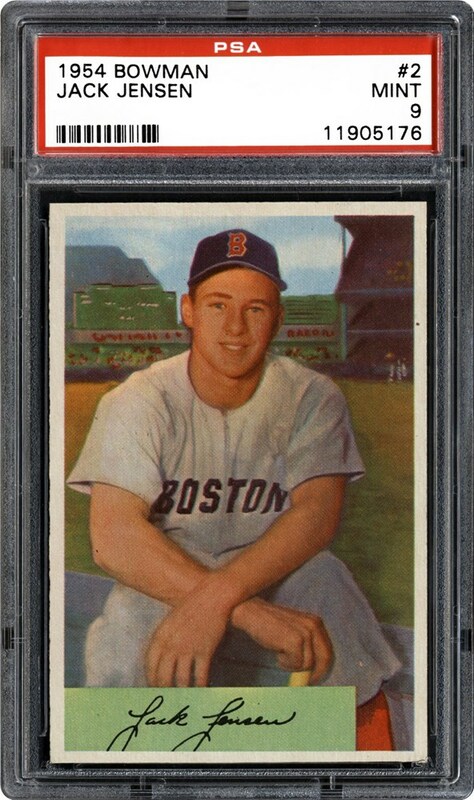 While outside the scope of this sports write-up, 1939 marked the significant escalation of World War II and Goudey Gum turned its card making interest to wartime sets. See SkyTamer.com's Action Gum gallery for a great look at where they went next. 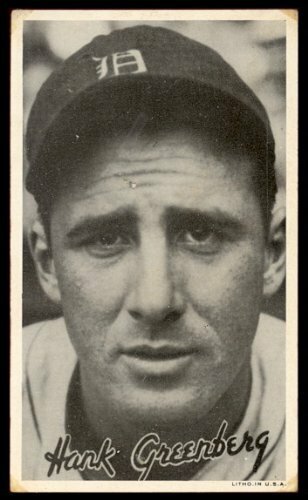 Now that we've worked through several years of international, competitive card-making, my next project's to write more about twelve months where Goudey found itself as, once again, the only game in town. That would be 1938. As an extra lagniappe for the detail-minded, here's my exciting appendix of World Wide Gum research! 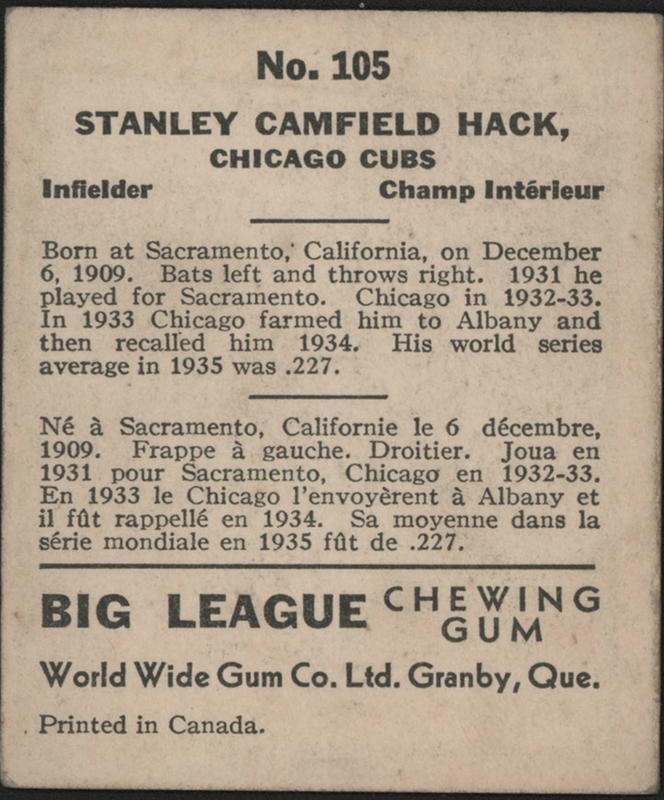 I flipped through available card backs, noted its latest year or event mentioned, and used them to help organize the 1936-37 World Wide Gum Big League Gum set. 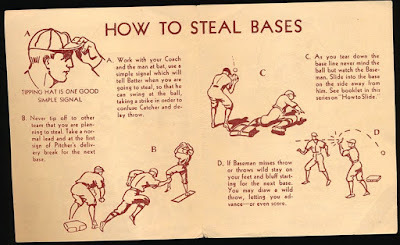 #23 Schumacher - "...longest consecutive winning streak among NL flingers in 1935"
#26 Myatt - "...with the New York Giants in 1935"
#28 Ripple - "Played on Dizzy Dean's All-Stars following 1935..."
#36 Castleman - "...early in 1935"
#37 Bartell - "...to the Giants in 1935"
#43 Goslin - "...won the 1935 World Championship"
#46 Cronin - "...signed Cronin for Pittsburgh in 1935." 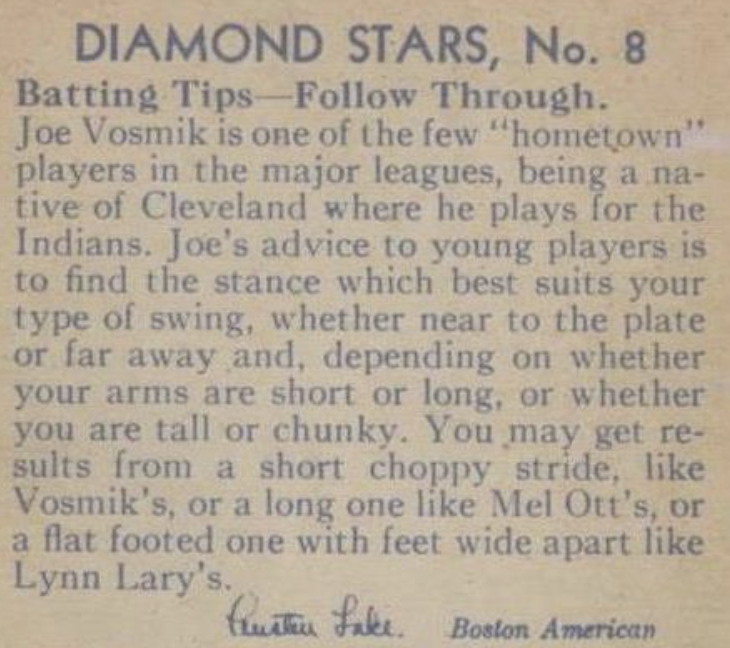 #49 Gelbert - "His return to the Cardinals in 1935..."
#51 DiMaggio - "...in 1935, hit .398"
#54 Caravetta - "...step into Grimm's brogans in 1935." #55 Cuyler - "...joining the Reds in 1935." 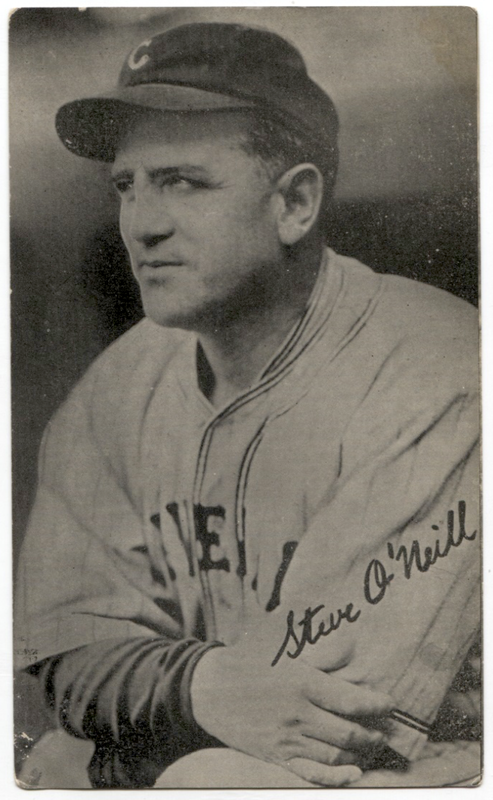 #62 Sewell - "...member of the White Sox in 1935." #67 O'Neill - "...toward the close of 1935." #73 Manush - "...revamping his battlefront for 1936..."
#75 Medwick - "He saw action in 154 championship games in 1935." 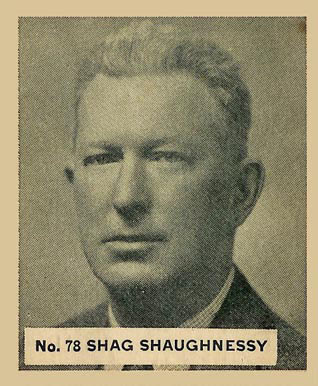 #78 Shaughnessy - "...the latter in 1935." #89 Grimm - "...in 1935 to win the flag." 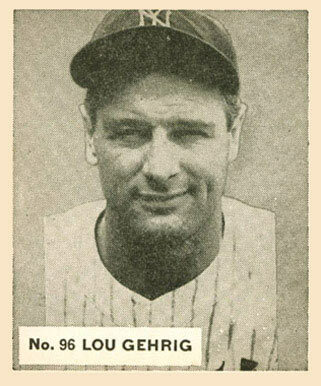 #96 Gehrig - "...scored the most runs in 1935." 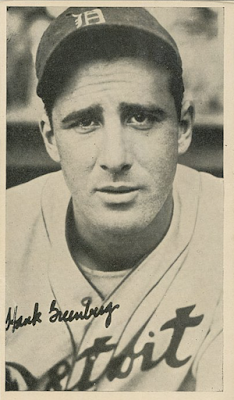 #97 Jurges - "...in the world's series, 1935, was .296." #100 Warneke - "...slab aces of the 1935 World Series." 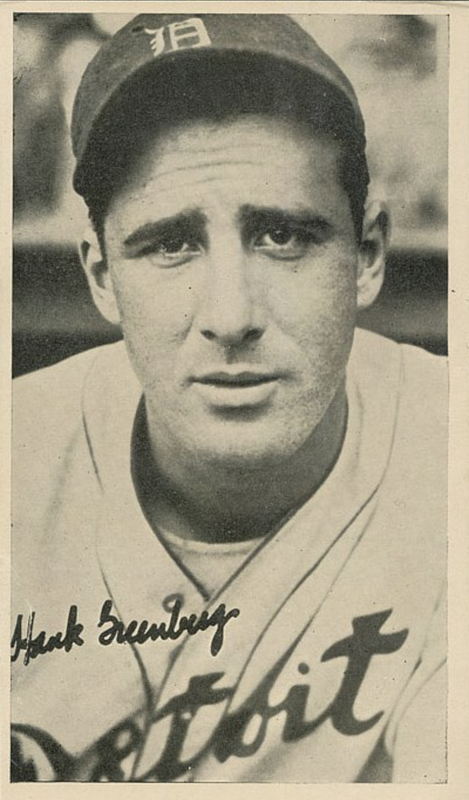 #104 Lawson - "...splitting the 1935 season..."
#105 Hack - "...World Series average in 1935 was .227." 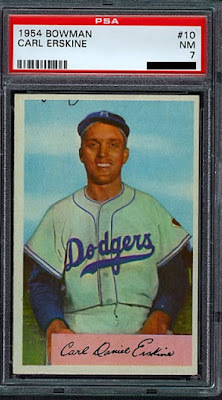 #106 Galan - "...Led the NL in runs scored and stolen base for 1935." #109 Lee - "...in 1934-35 he played for Chicago Cubs." 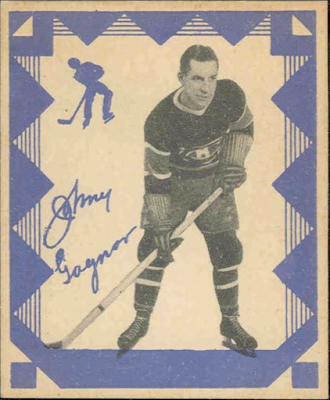 #126 Benny Bates - "1934-35 with Beaumont and from there he was sold to Montreal." 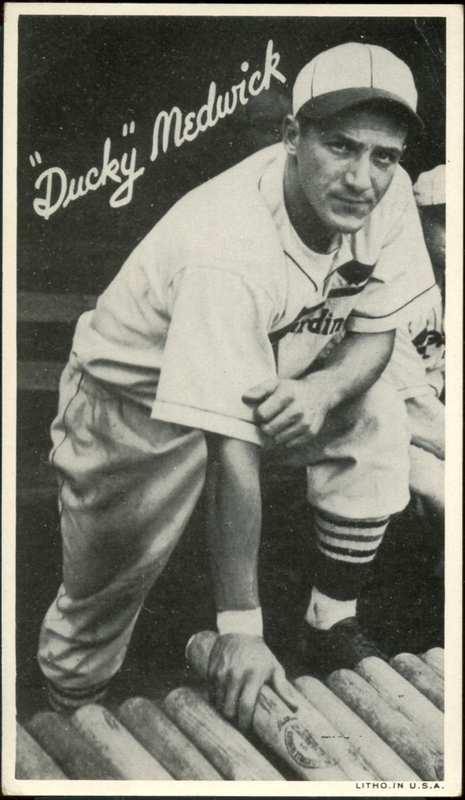 #127 George Puccinelli - "Batted .359 with Orioles in 1935." #130 - Bucky Harris - "...returning in 1935 to boss the Capitol city troupe." #132 - Buddy Myer - "1935 batting champion of the AL." #6 Vaughan - "He played for Pittsburgh 32 - 33 - 34 - 36." Could be typo for 35. #65 Lindstrom - "...with the Dodgers for 1936..."
#79 - Smythe (Royals) - "...August 5, 1936"
#111 Reiber - "...played for Montreal during 1936." #121 Hal King - "Bought by Orioles from Montreal close 1936 season." 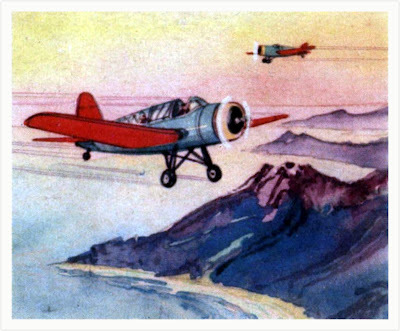 #122 Tom Abernathy - "Trials with Phils, 1936." #123 Phil Hensiek - "...from Montreal in the season of 1936." #124 Ray Schalk - "Managed Buffalo club, IL champions, 1936." #125 Paul Dunlap - "Binghamton of NY-Penn League in 1936." 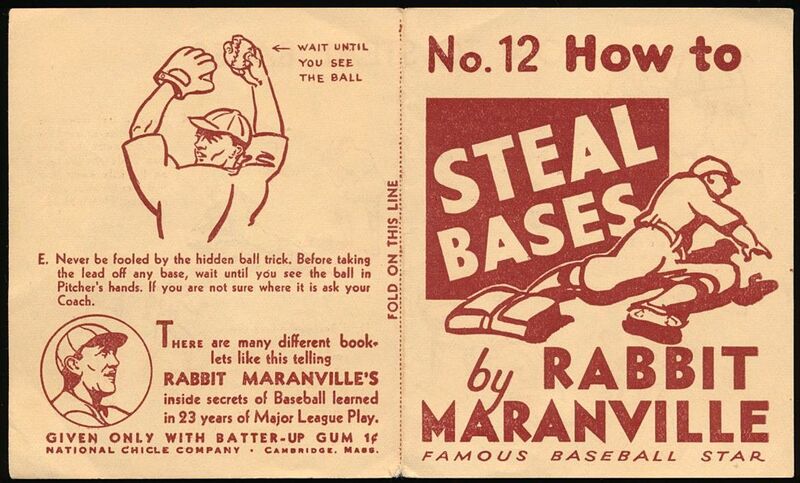 #129 - Rabbit Maranville MGR - "Signed to manage Montreal Royals, October, 1936." #135 - Phil Weintraub - "...second in the IL batting honors, with an average of .371 for 1936." 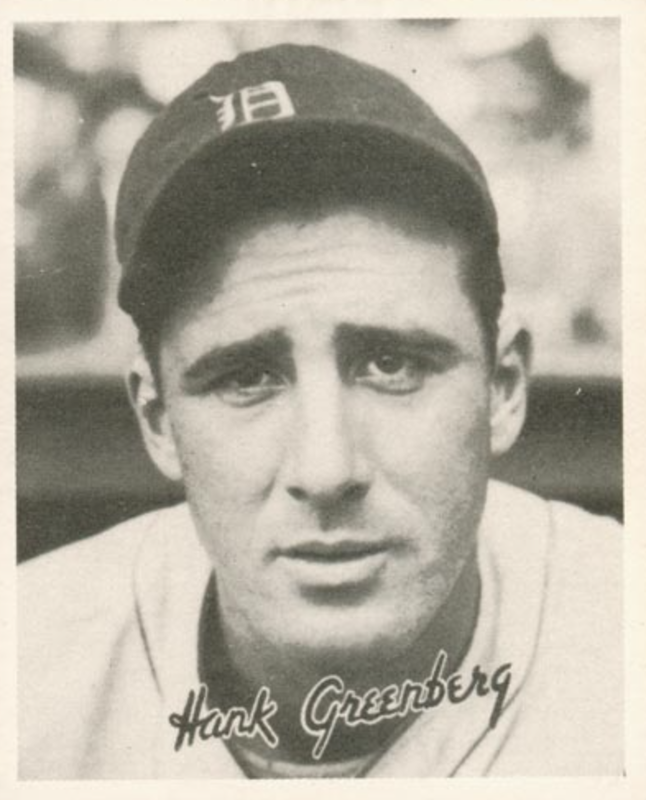 #32 Clifton - "Joining the Tigers in 1934." Written for an earlier set and repurposed for this one? #128 - Stevie Stephenson - "He regards Friday the 13th as his lucky day."